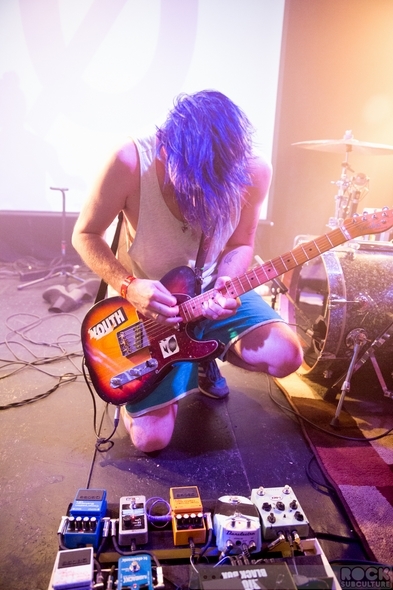 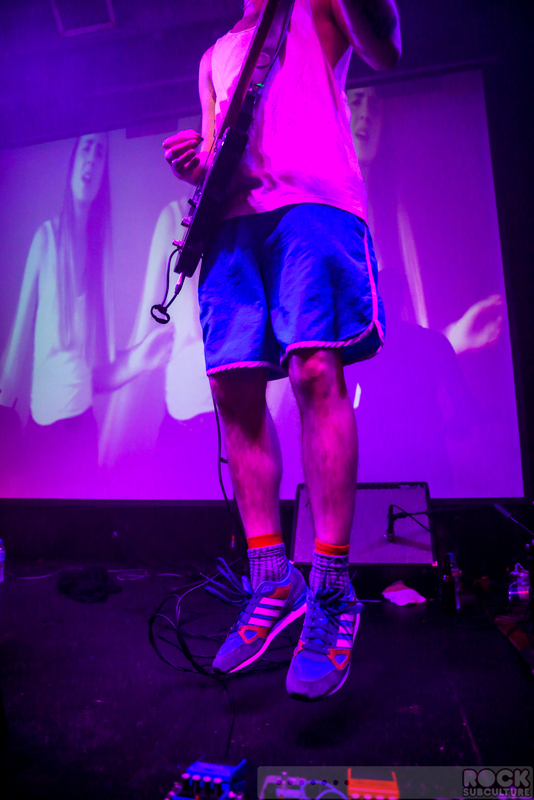 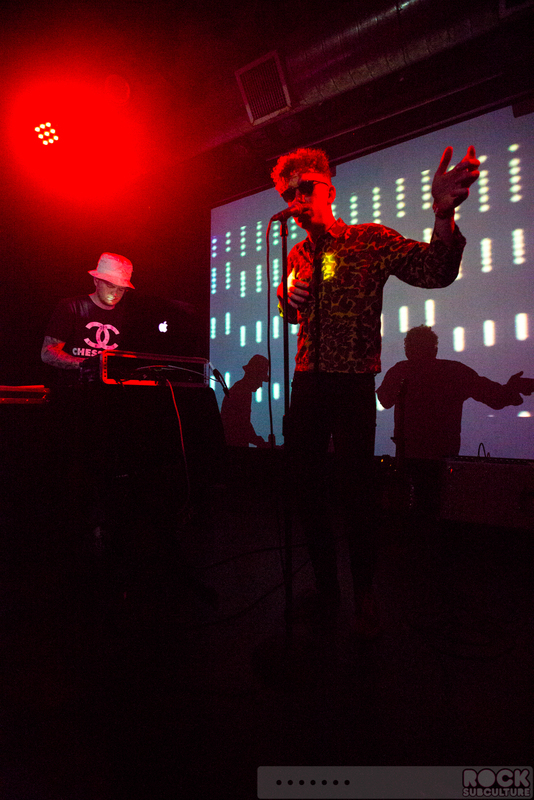 Tuesday night’s show at Rickshaw Stop was part of the Popscene series of shows that host quality, new, and breaking bands to the Bay Area. 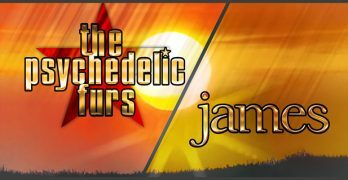 There was a long line building for the two young artists leading up to the 8:00 doors time, with a couple from Napa having started the line around 2:00 that afternoon. 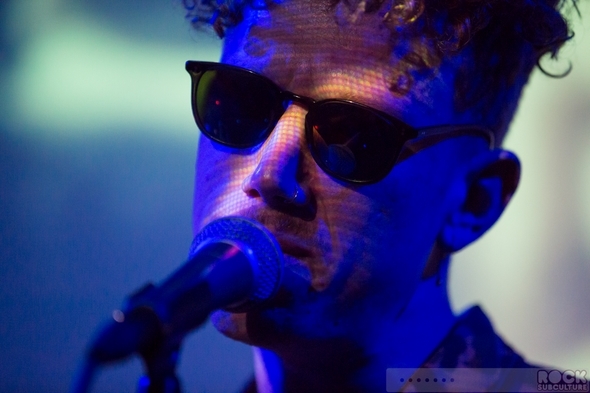 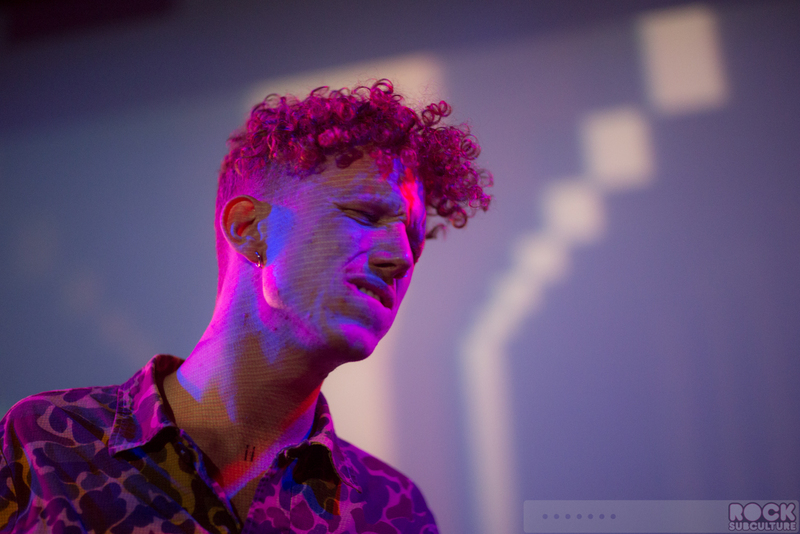 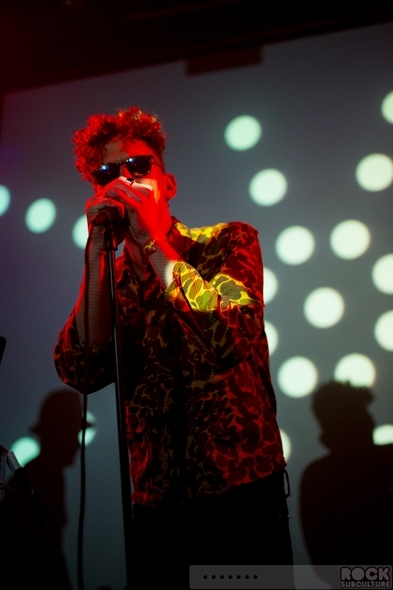 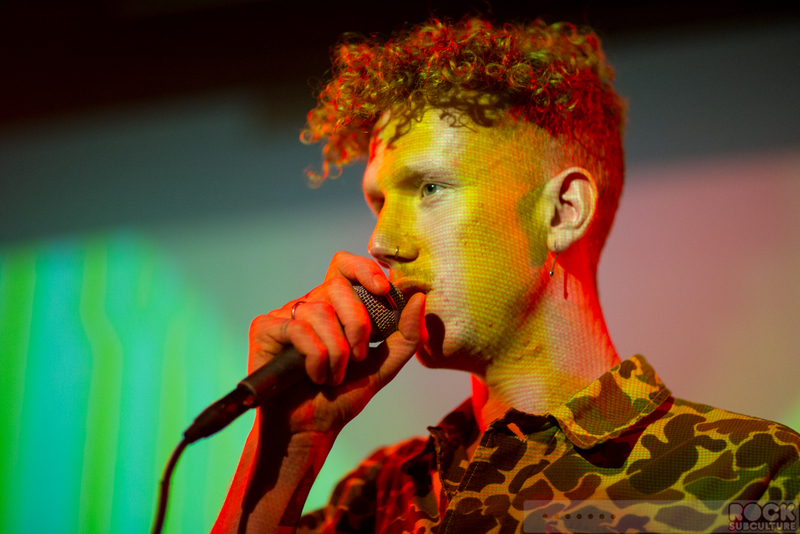 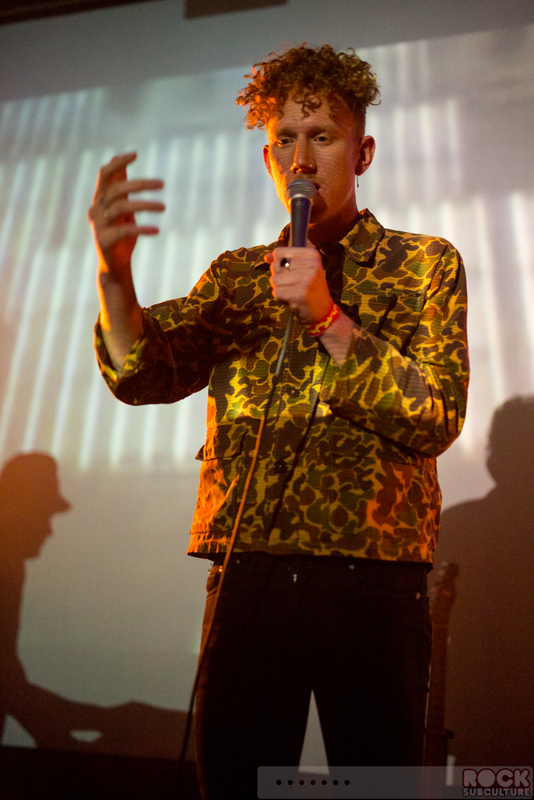 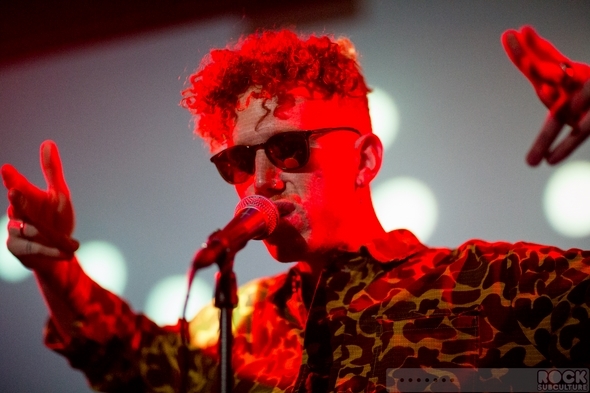 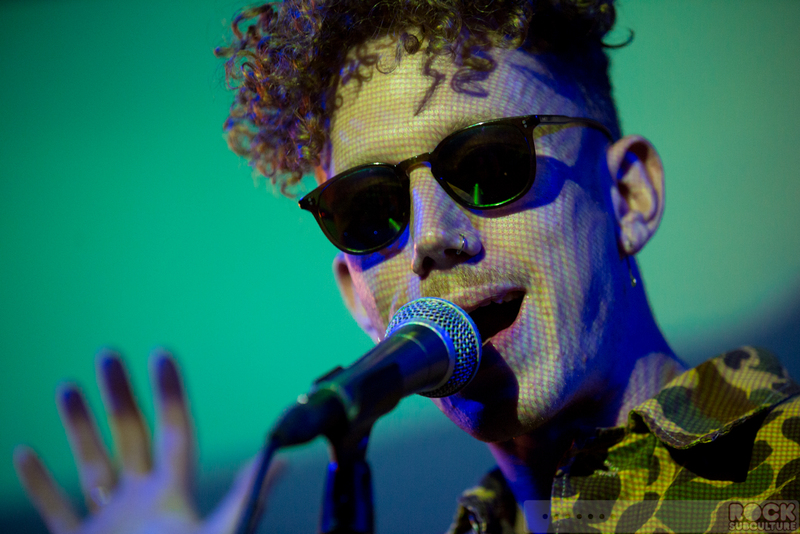 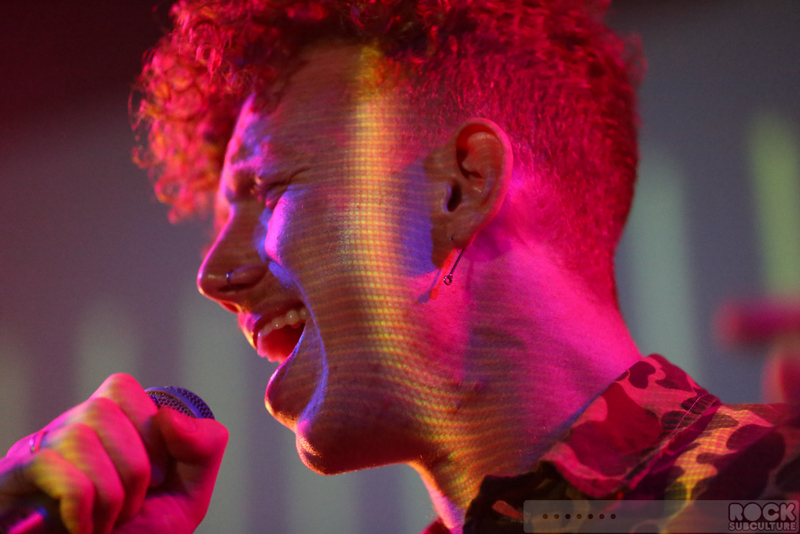 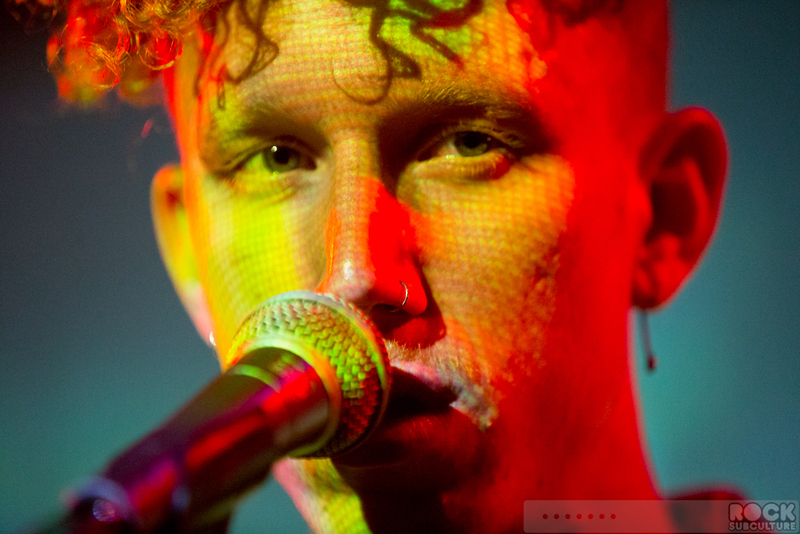 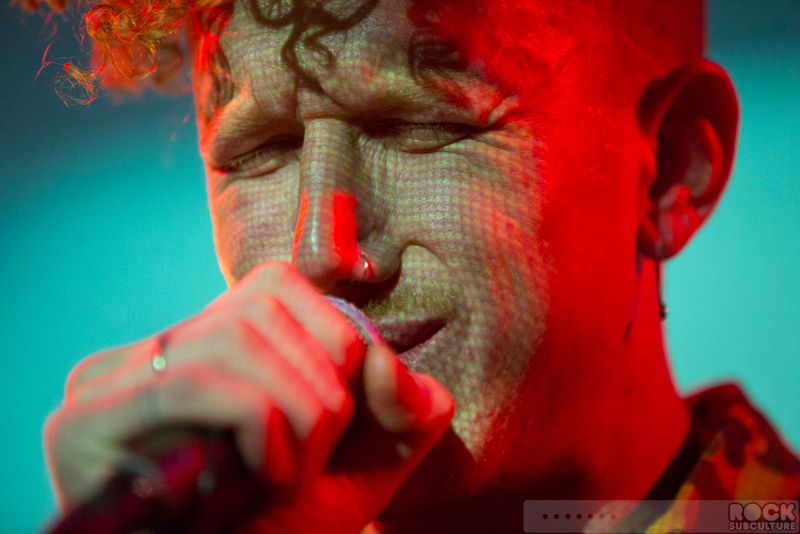 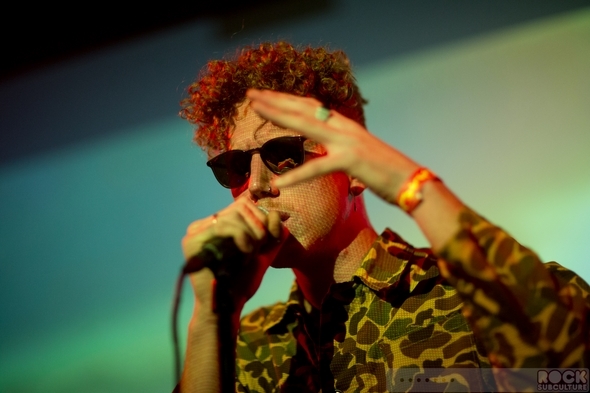 I had arranged to interview Erik Hassle prior to the show, and that video and audio podcast is now available in a separate article (see: “Erik Hassle: “Rock Talk” Podcast Audio + Video Interview“). 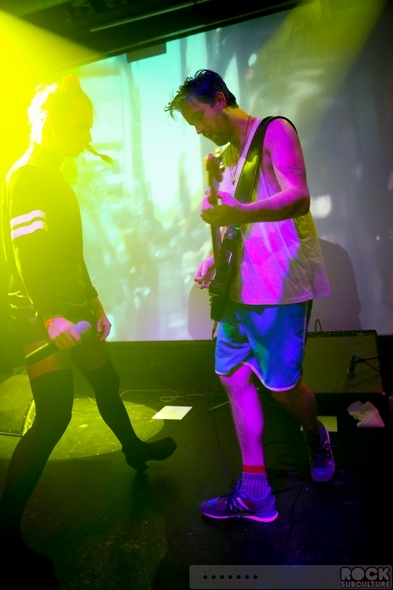 Prior to the interview, I caught the end of Erik’s sound check, and knew right then it was going to be a stellar evening. The music was already pumping as fans entered the venue, with Aaron Axelsen (also Live 105’s Music Director) putting on the best DJ set I’ve heard all year, hands down. He laid down some amazing mixes and had me reaching for my SoundHound app to look up a few of the songs he was spinning that I was not familiar with… he also filled in the nearly two hours of time prior to Erik taking the stage with high energy and building music that seemed to quickly populate the sold out space and keep people moving. Overall, it was an amazing night of music, and seeing both Erik Hassle and MØ live in concert for the first time, I definitely add both to my list of favorite new and newer/breaking artists of the past few years (in the same company with MS MR, Meg Myers, Kitten, GROUPLOVE, Charli XCX, Reignwolf, Of Monsters and Men, and a few others). 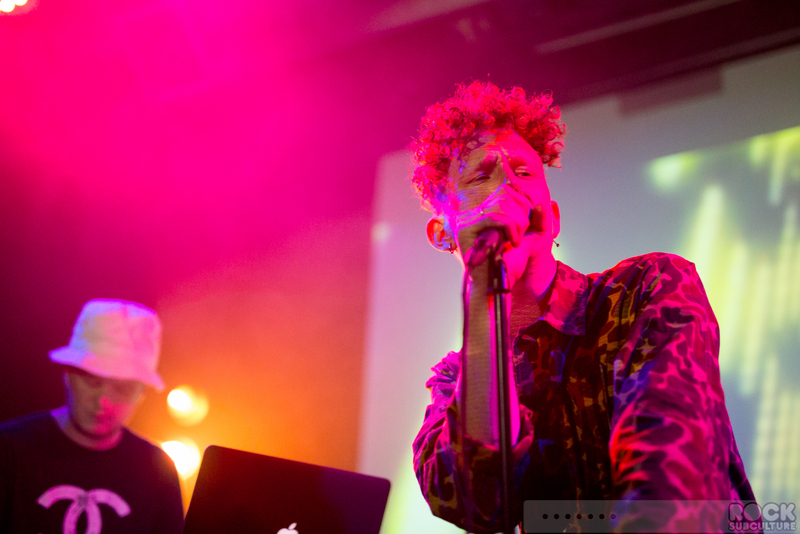 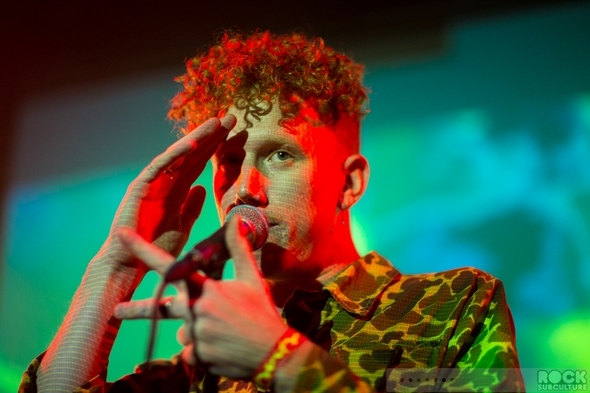 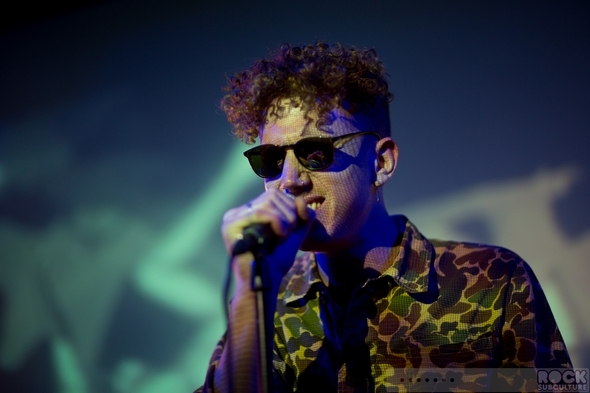 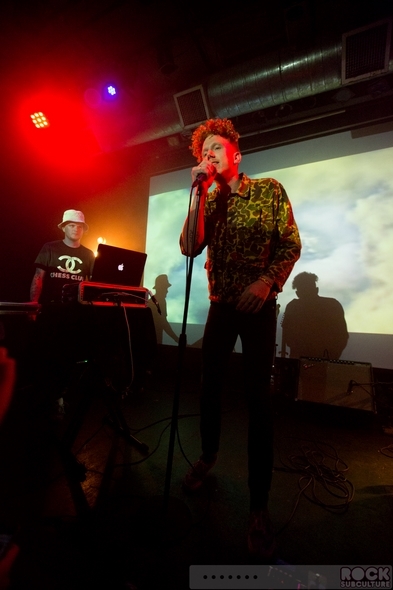 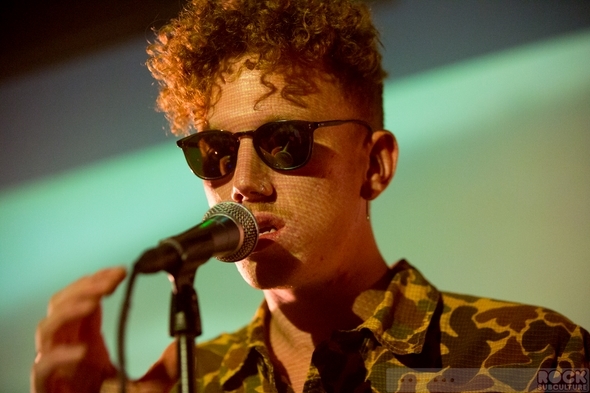 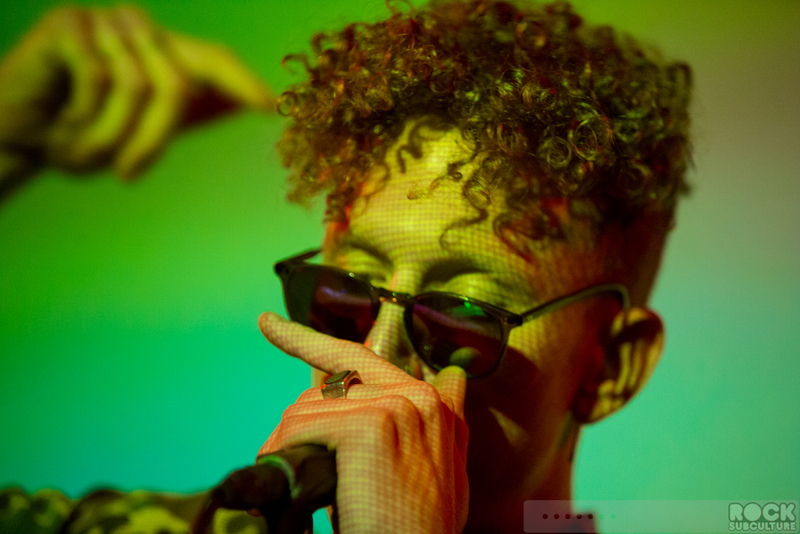 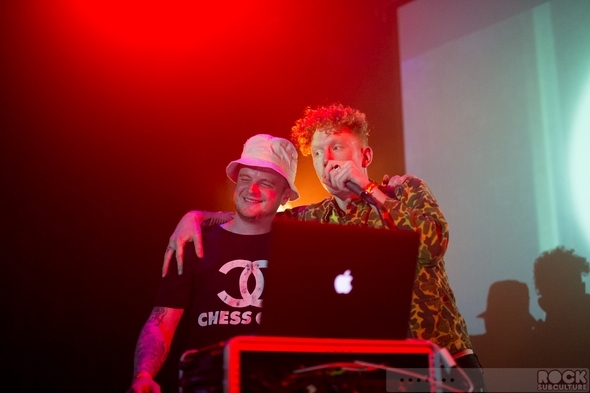 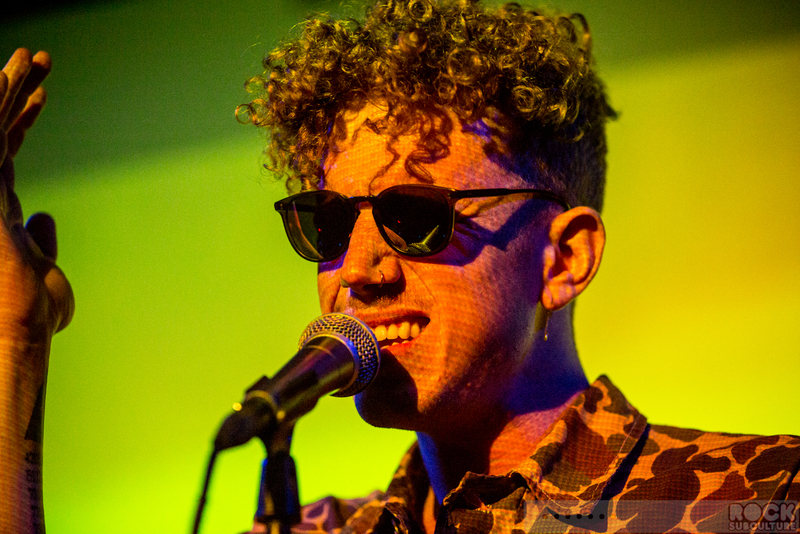 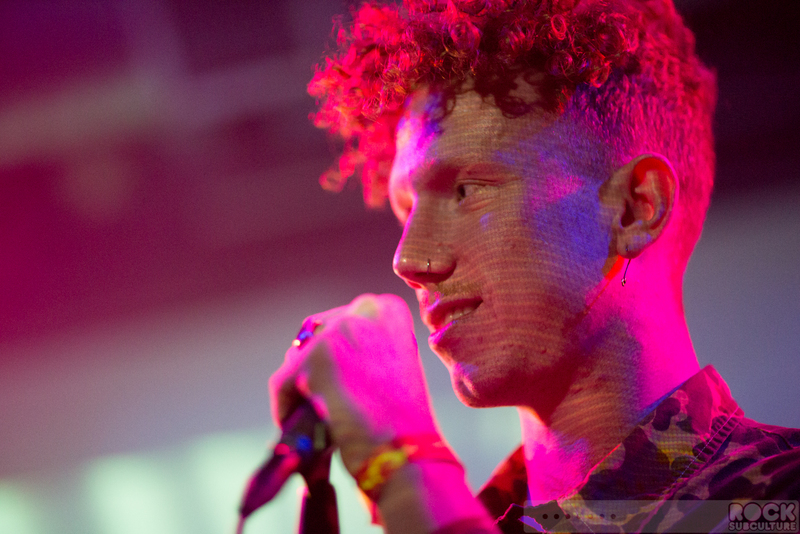 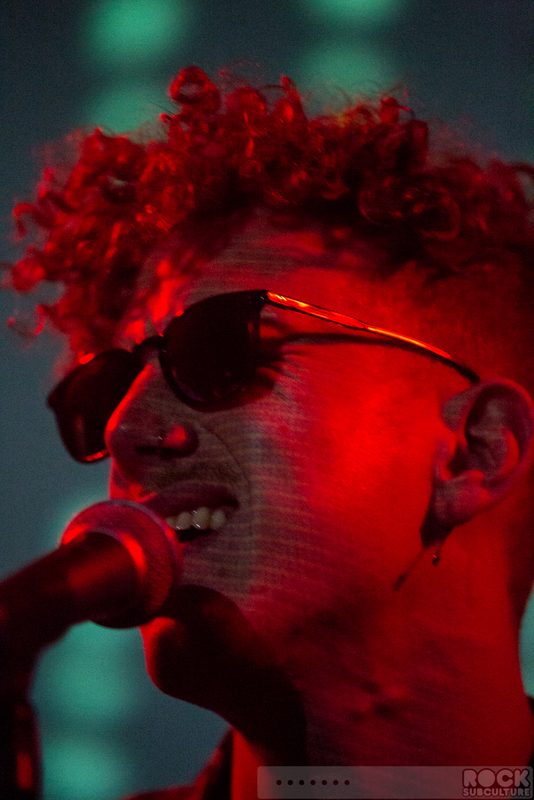 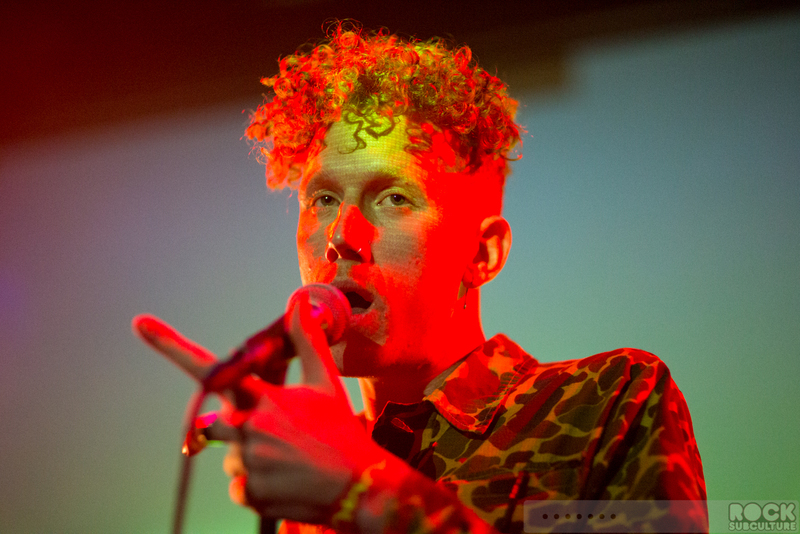 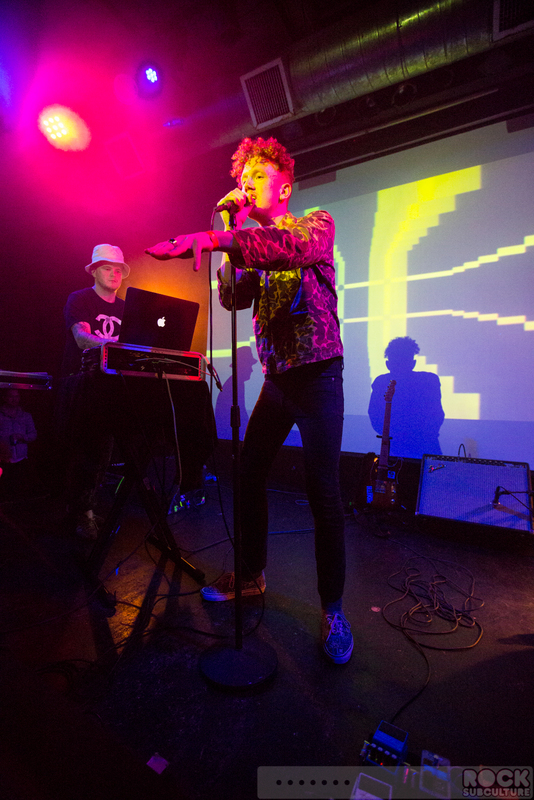 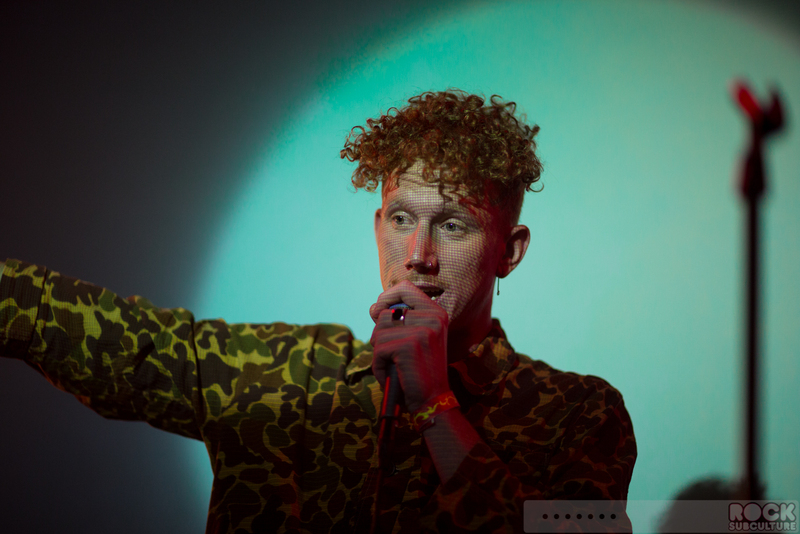 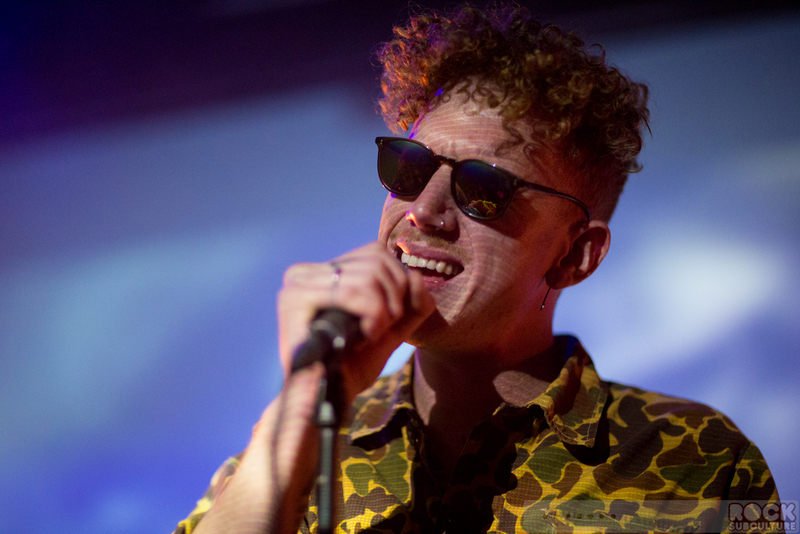 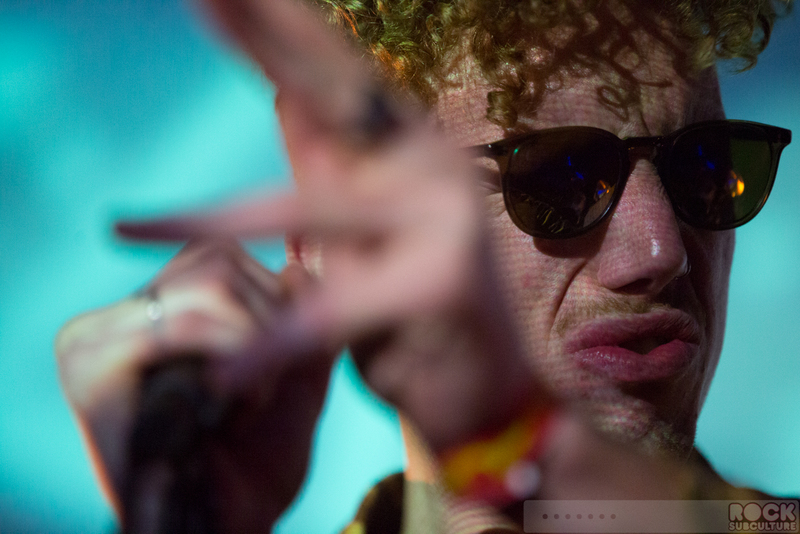 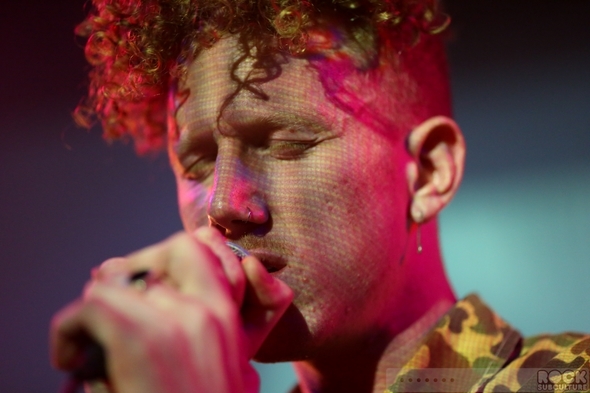 Erik Hassle was born in Katrineholm, Sweden and at just 25, has built quite a career in music in the time since he turned 18 years old. 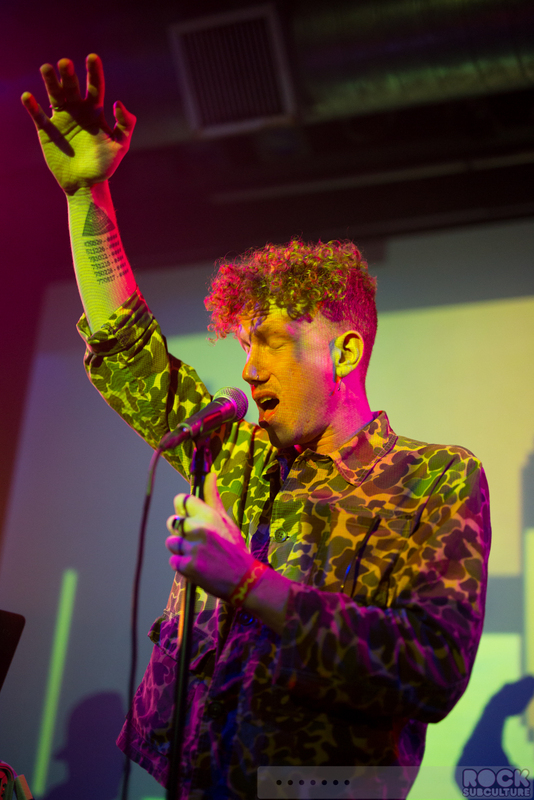 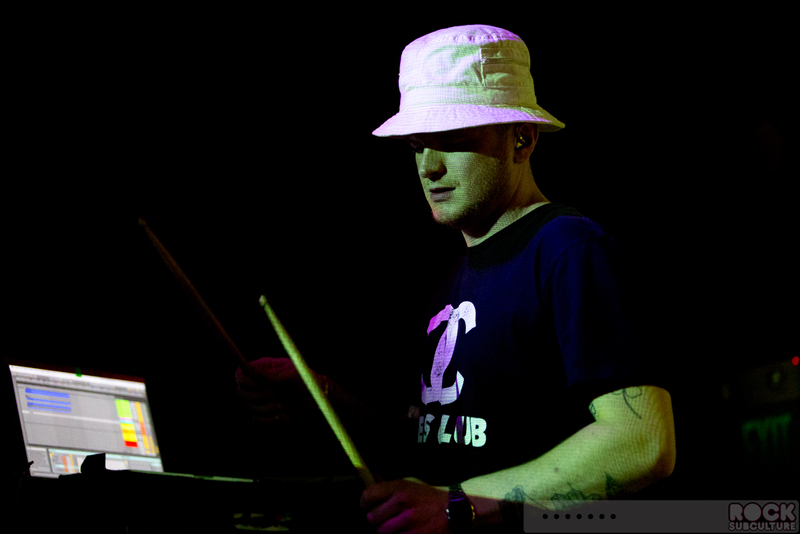 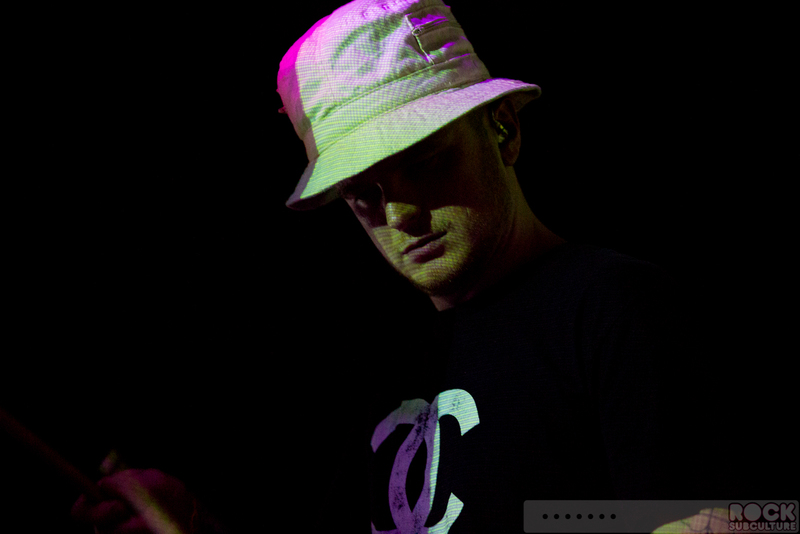 In that time, he has released four studio albums (even having taken a two year break), and has recently forged a new path with his music, with his amazing Somebody’s Party EP, which hit earlier this year. 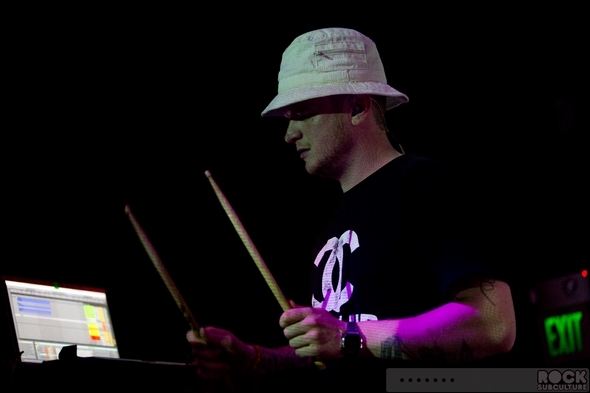 In addition to writing his own music, he was also one of the writers of the new hit Shakira song “Can’t Remember to Forget You”, which features Rihanna as well. 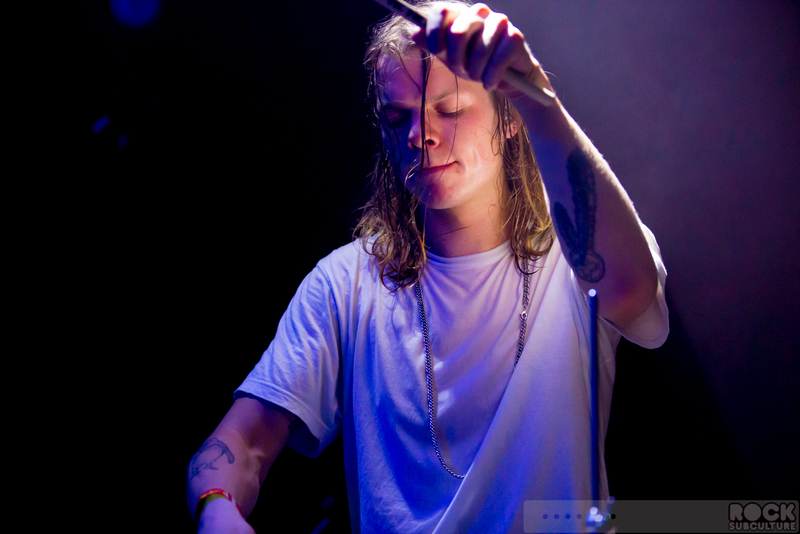 I just got introduced to his music recently with his Somebody’s Party EP, and became an instant fan. 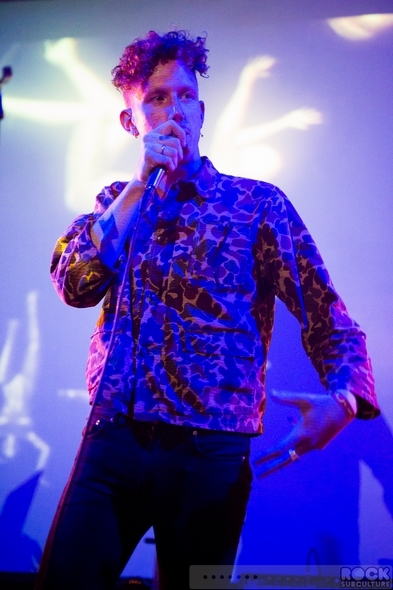 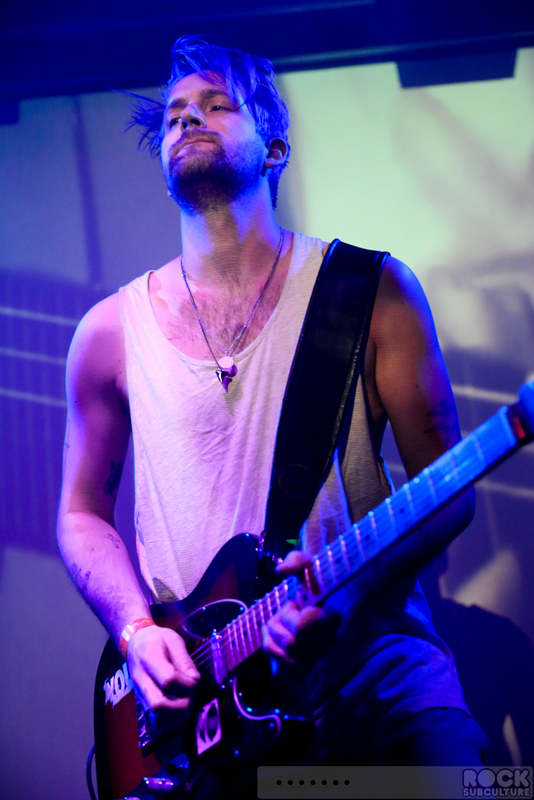 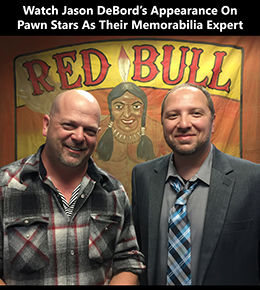 He has a really unique sound and voice, and was immediately hooked on his catchy, authentic songs. 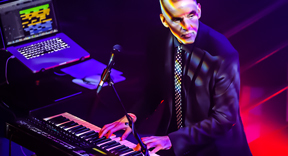 As discussed in our interview, bits and elements and vibes do remind me of some other favorite artists, but he has a very contemporary take on the soul genre. Live, with the minimalist instruments pre-recorded, the live versions of the song sounded much like the studio versions, though we was very engaging with the audience, which colored the entire set. 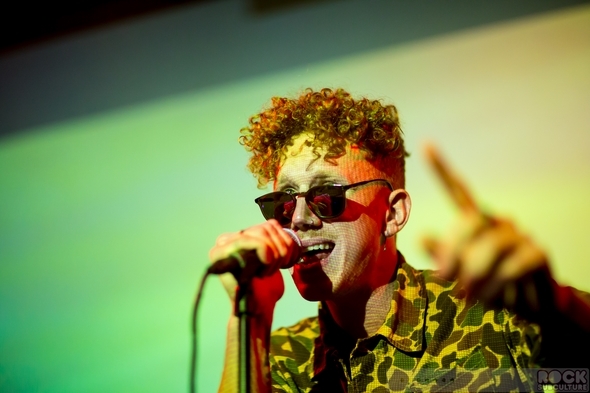 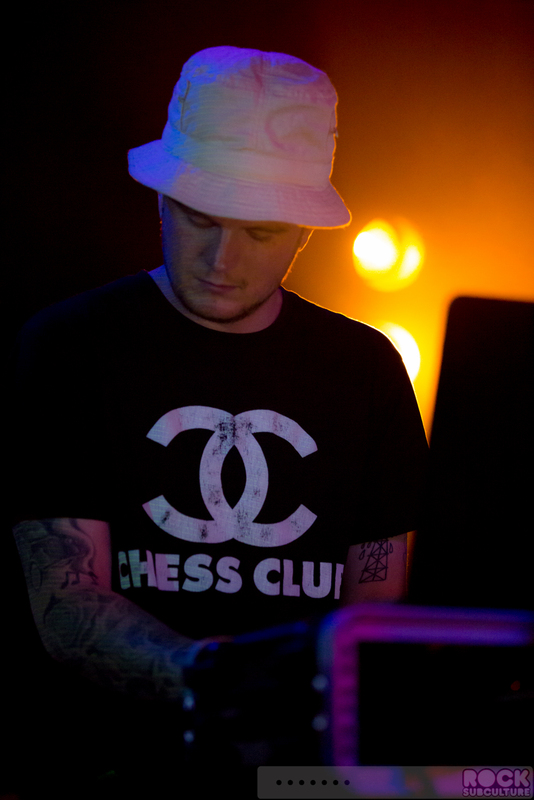 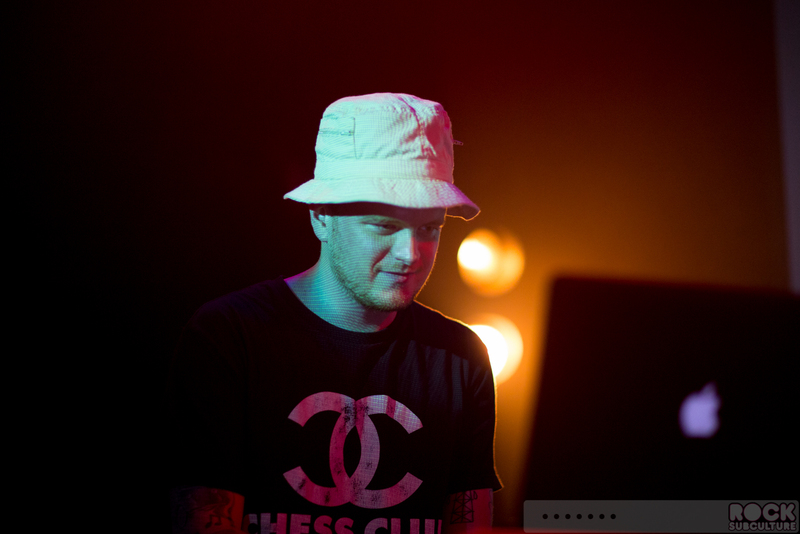 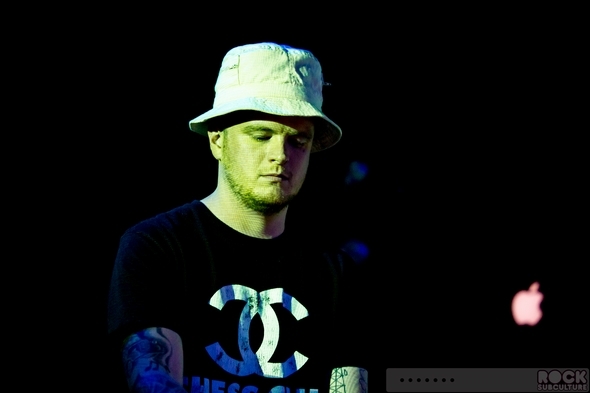 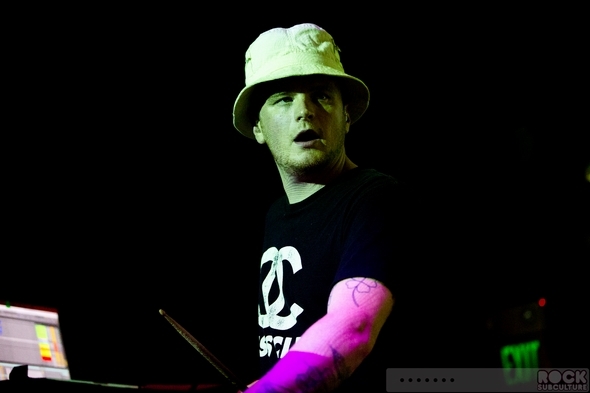 Erik is most definitely an artist I expect will break big, being more a matter of time and exposure than anything else, as he is a true artist with an ear for making music that should have mainstream appeal. 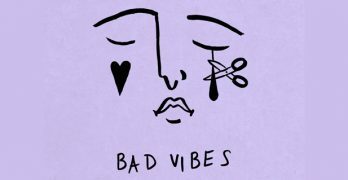 The fact that he is writing for artists with significant global stature – like Rihanna and Shakia – I think compound his future opportunities. 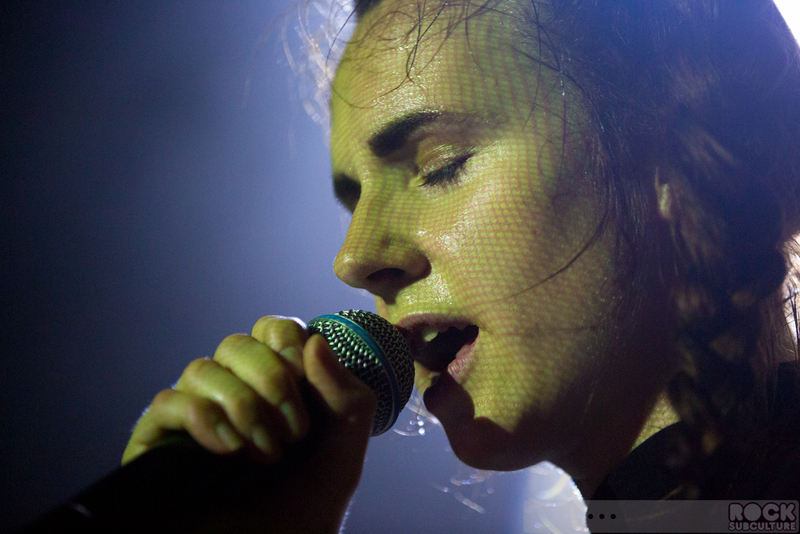 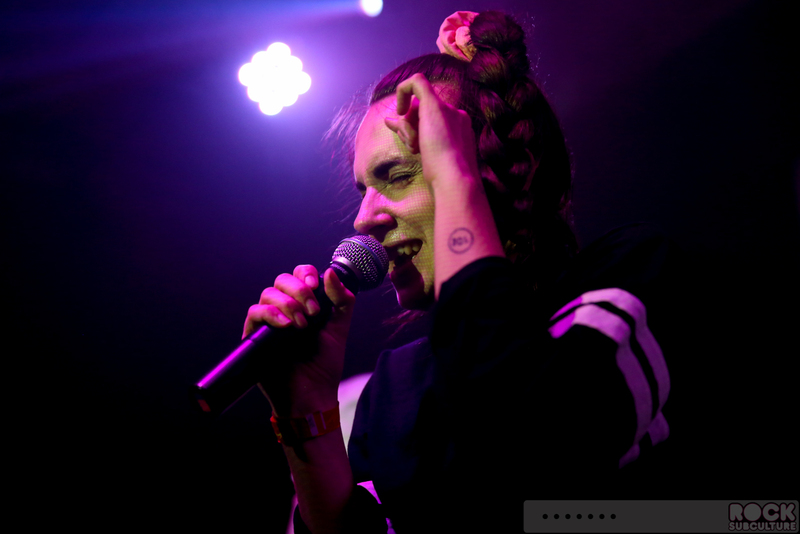 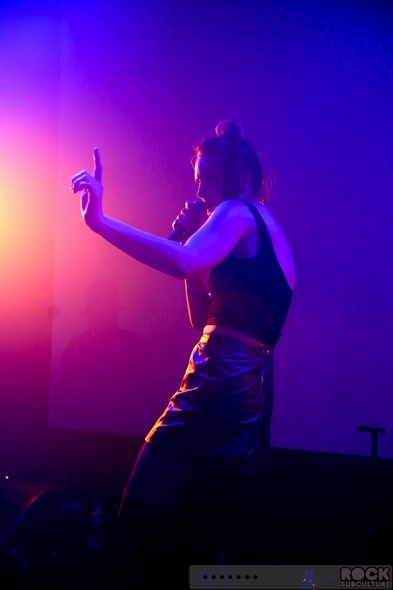 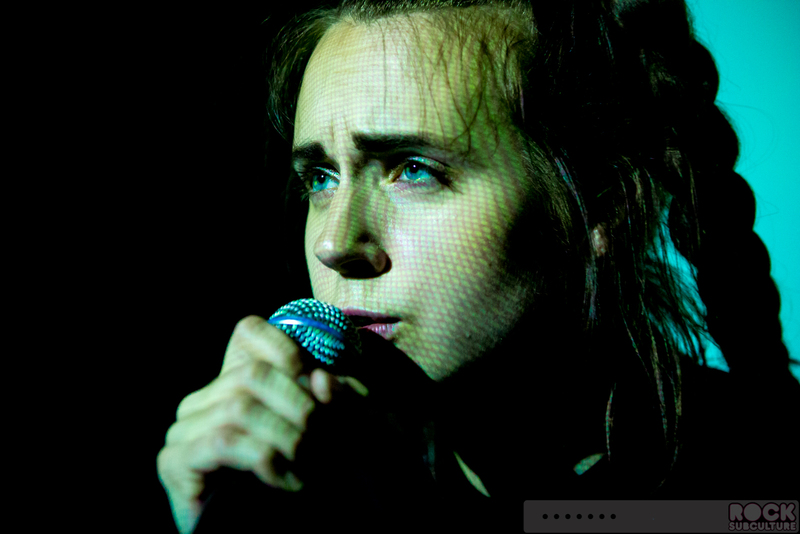 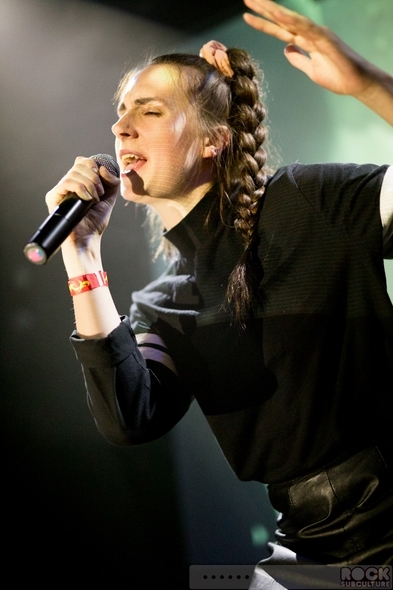 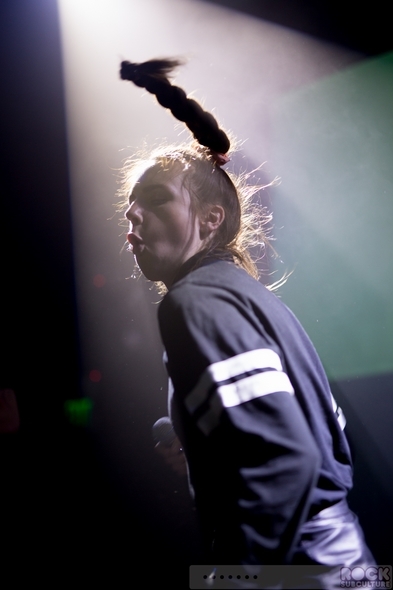 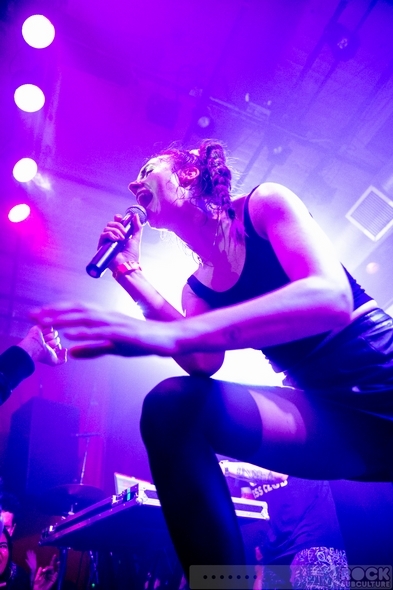 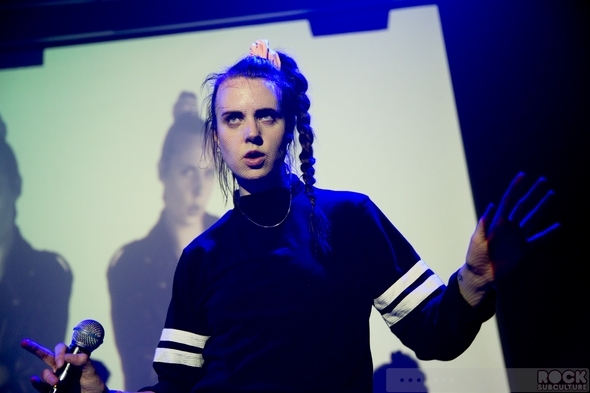 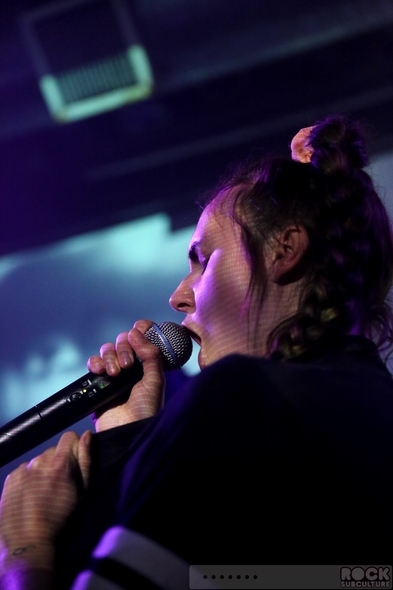 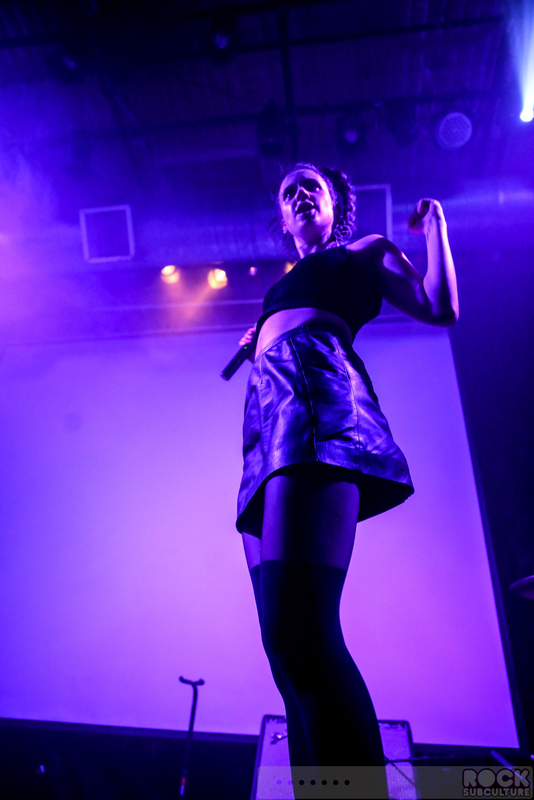 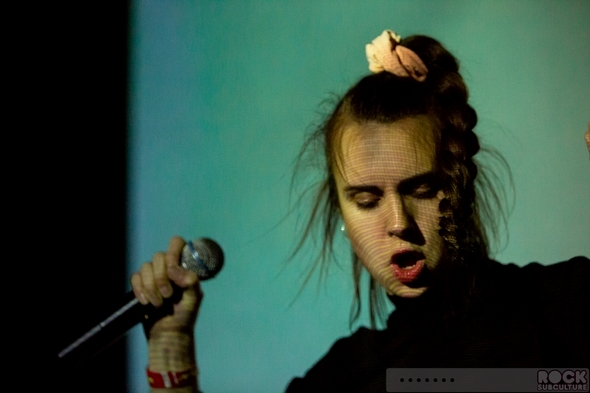 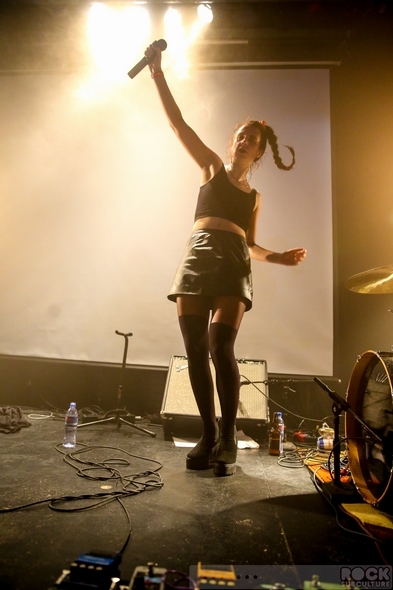 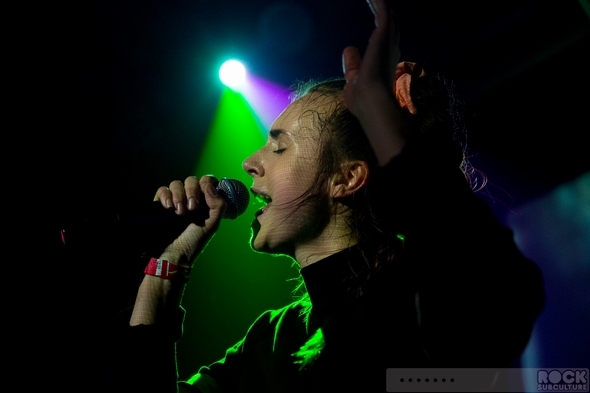 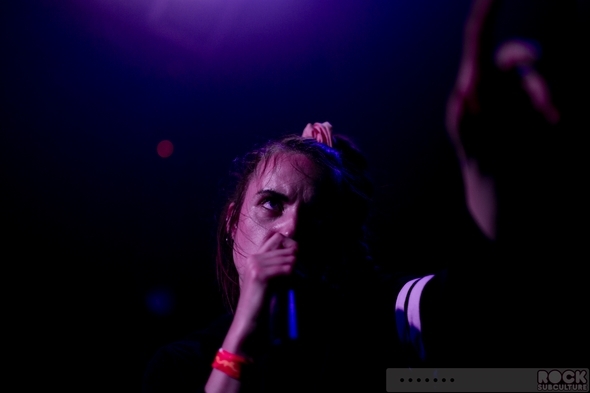 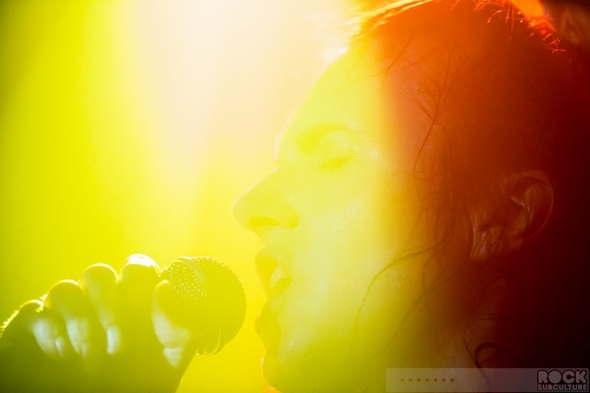 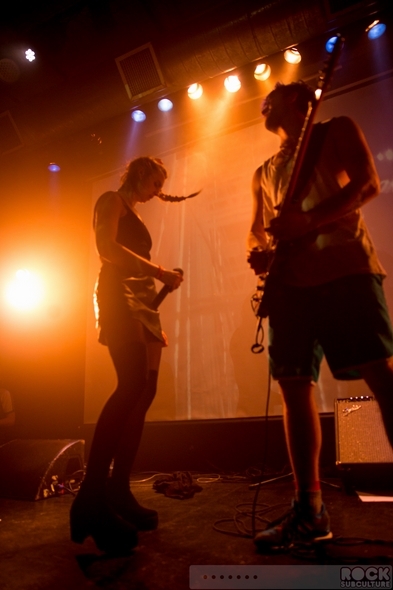 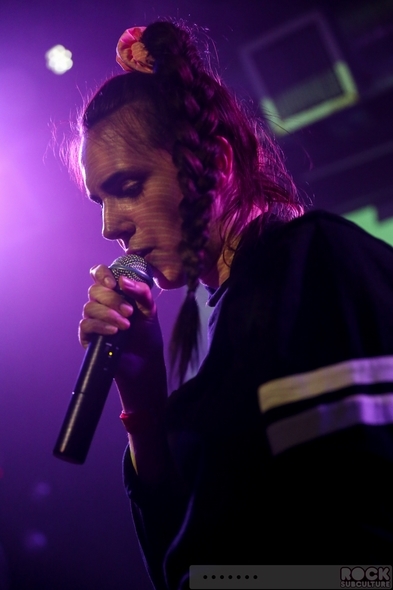 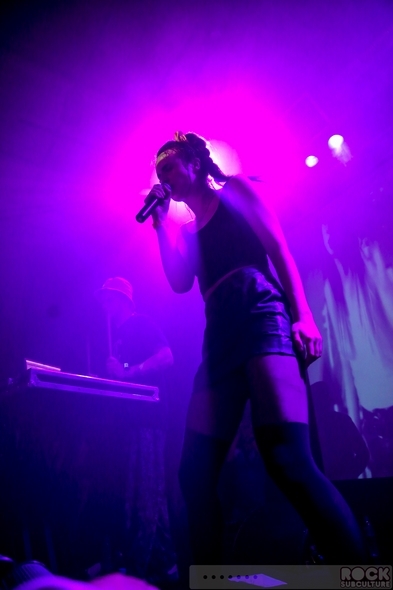 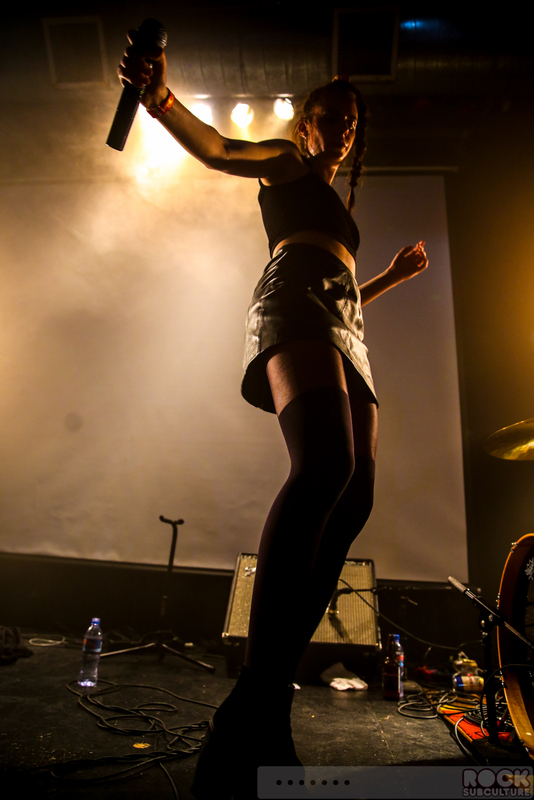 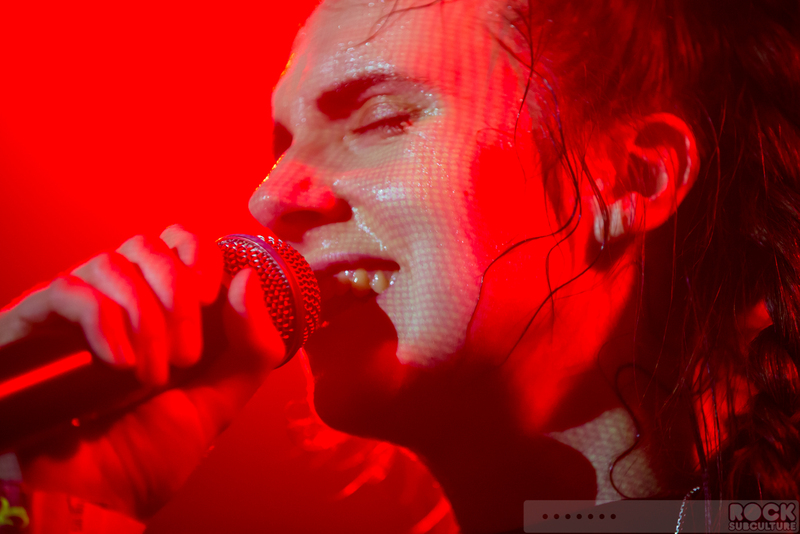 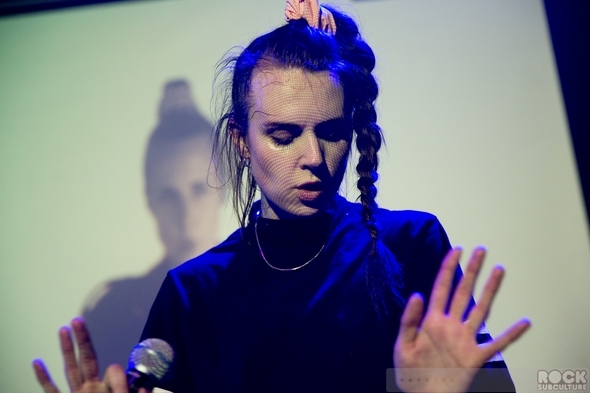 Like Erik Hassle, MØ is also 25 years old, though she was born in Odense, Denmark. 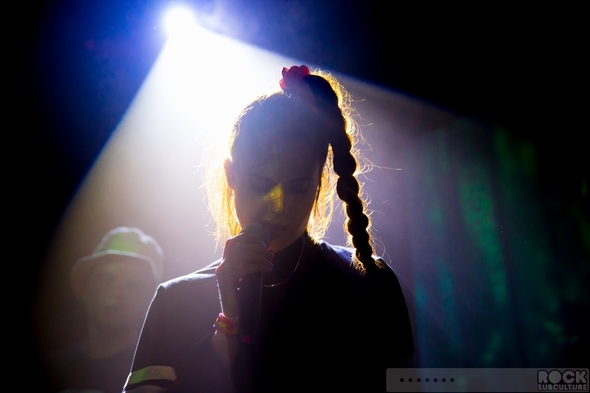 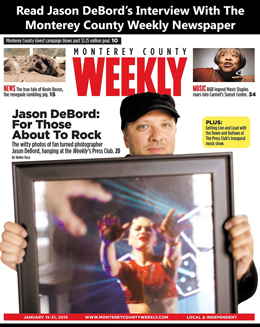 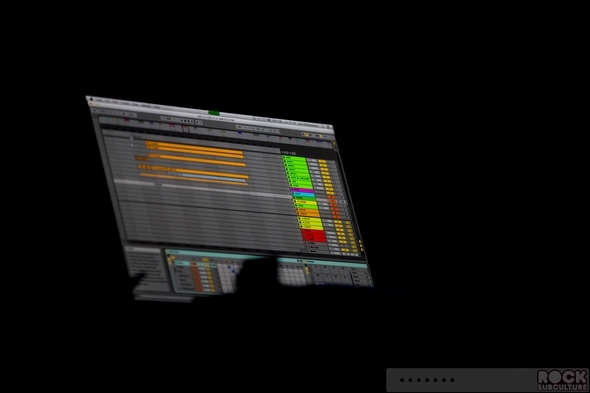 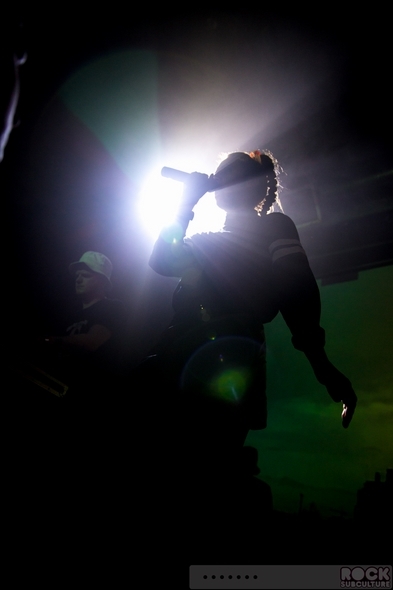 However, her music crosses over different genres, grounded in electronic and pop, as well as soul/R&B. 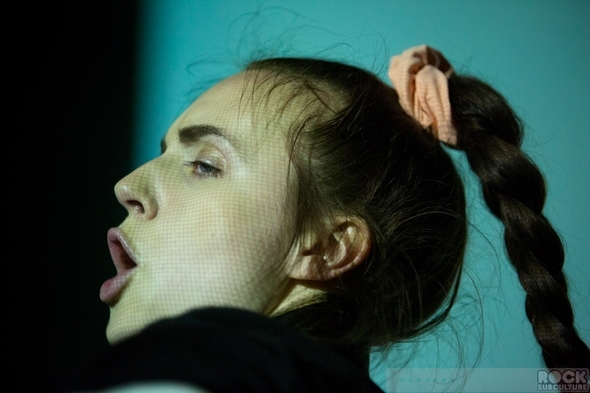 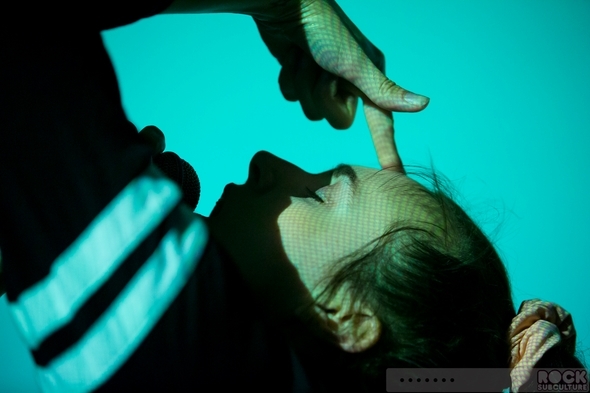 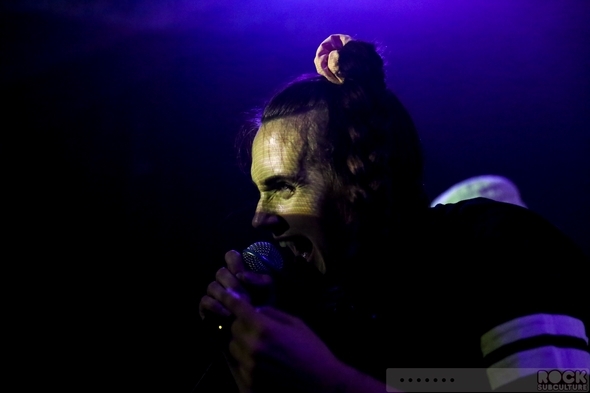 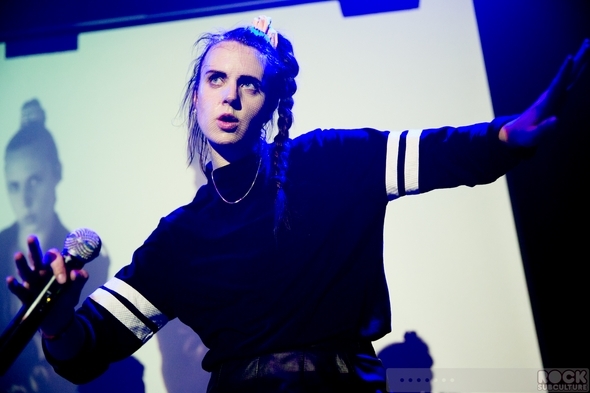 MØ released her first single last year, and her first studio album, No Mythologies to Follow, came out in March. 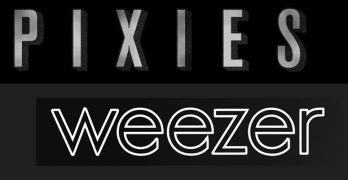 I just recently picked up the album, and I already rank it near the top of my favorite albums of the year thus far, and expect it will be somewhere on my Top 10 list at the end of 2014. 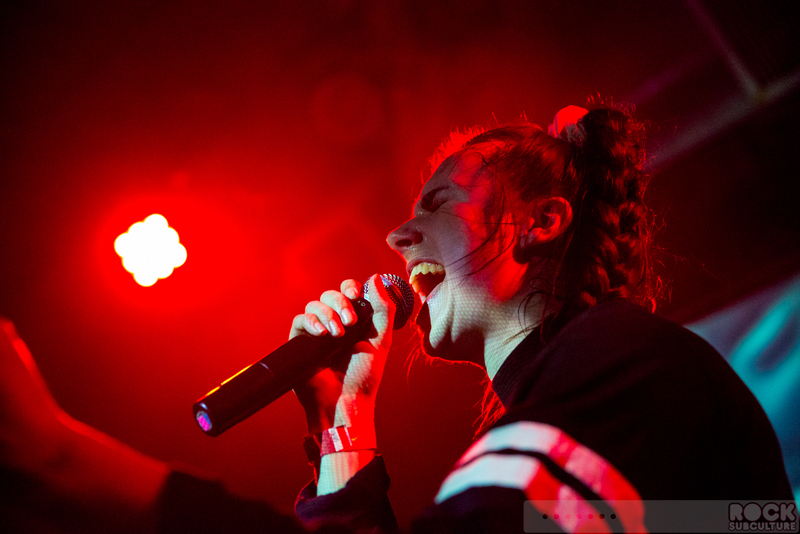 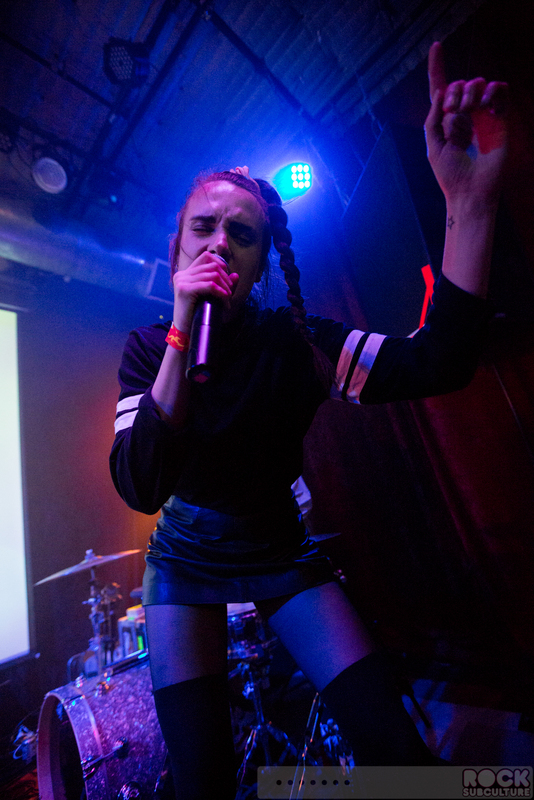 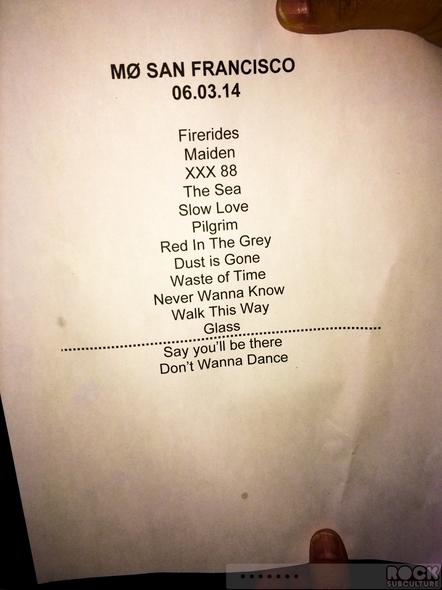 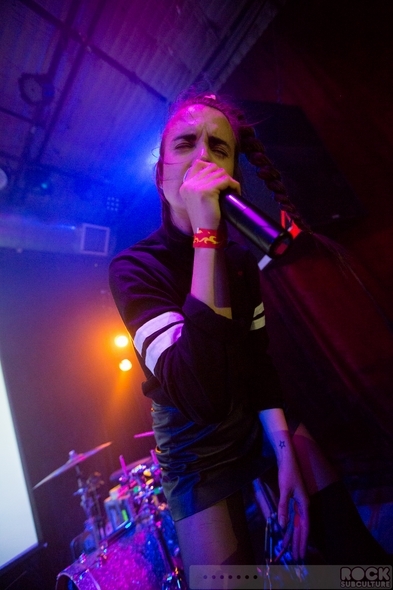 Just the night prior to the Rickshaw Stop show, MØ made an appearance as the musical guest on the Jimmy Kimmel show. 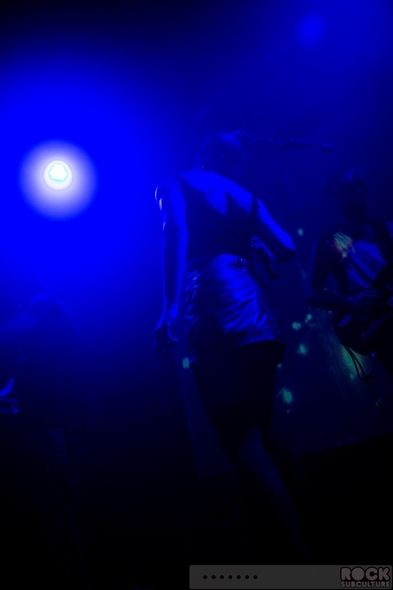 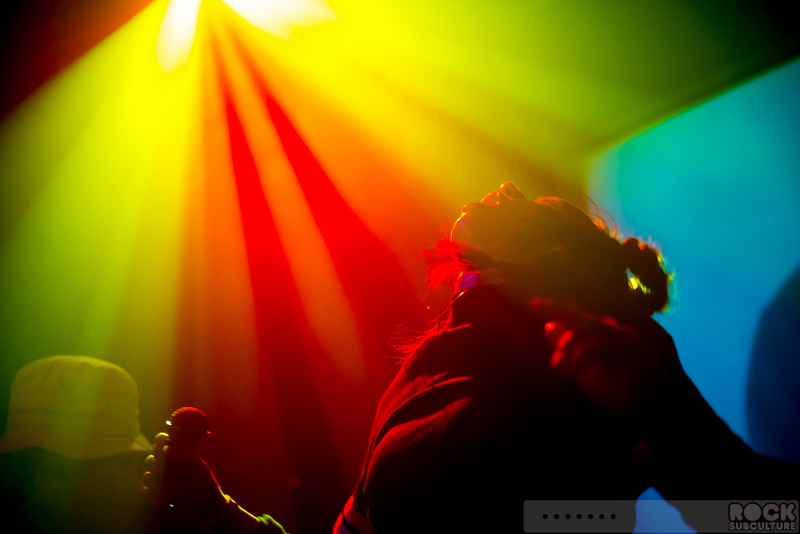 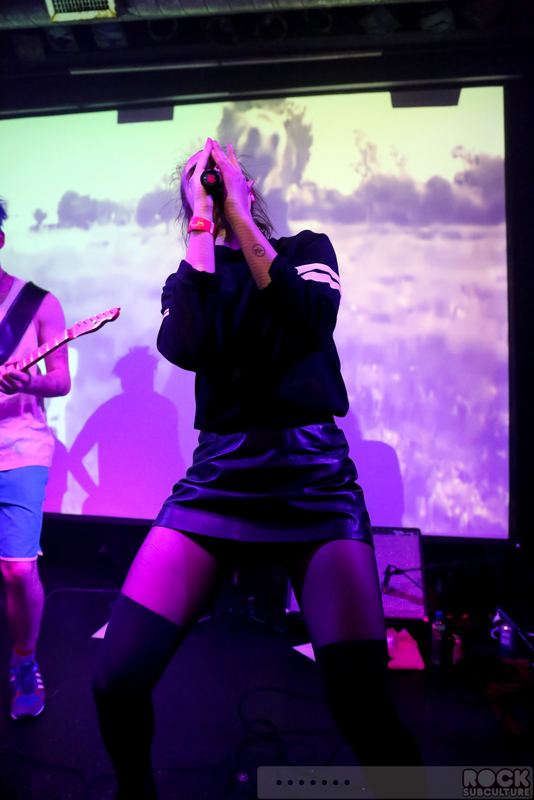 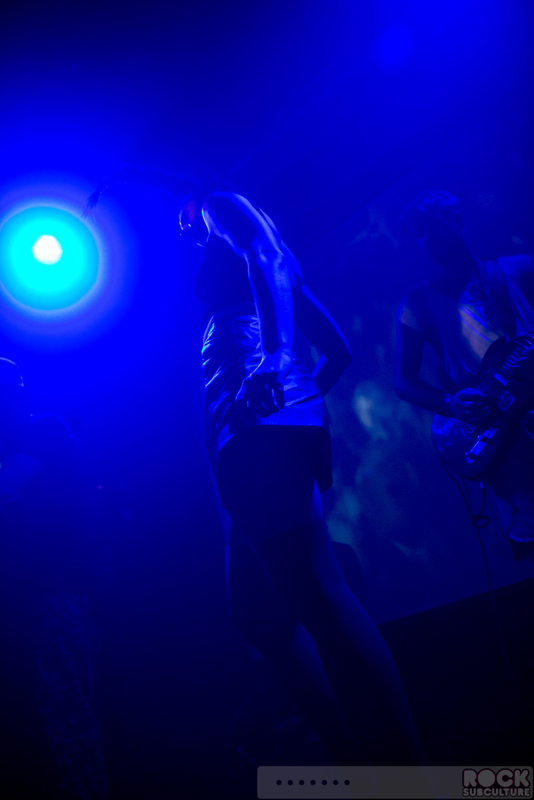 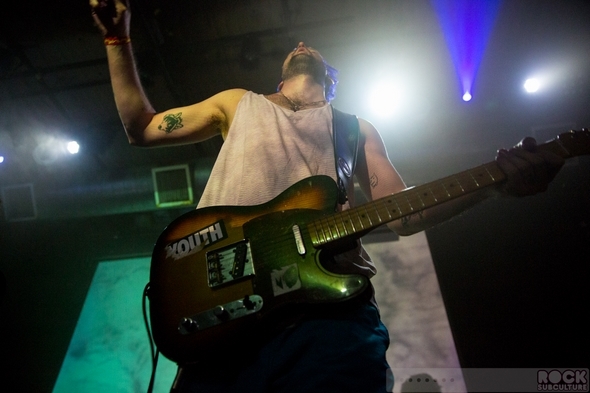 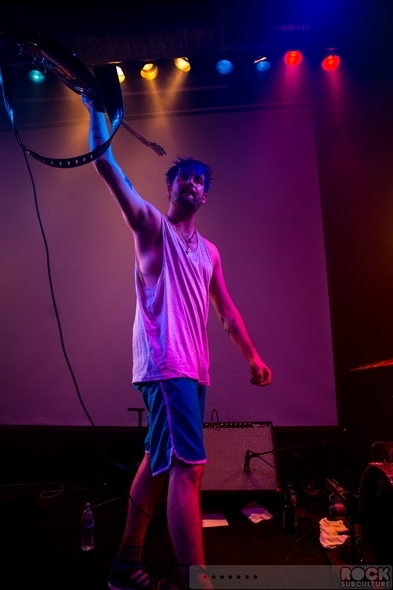 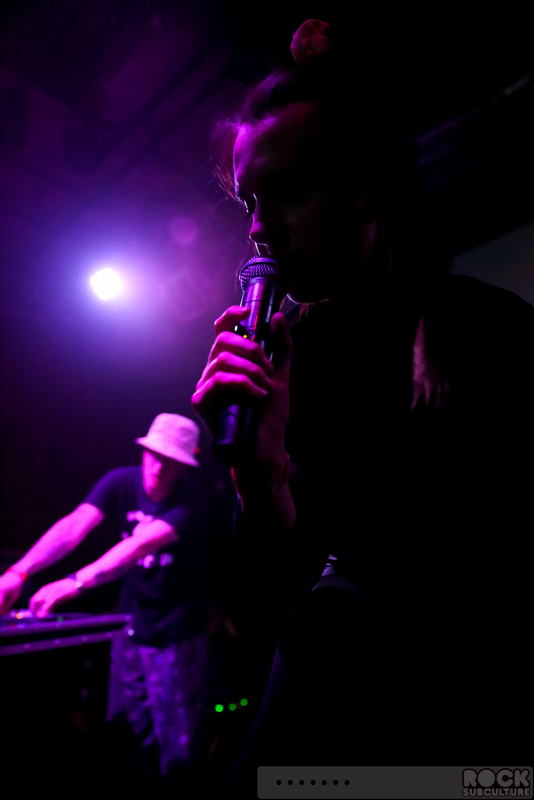 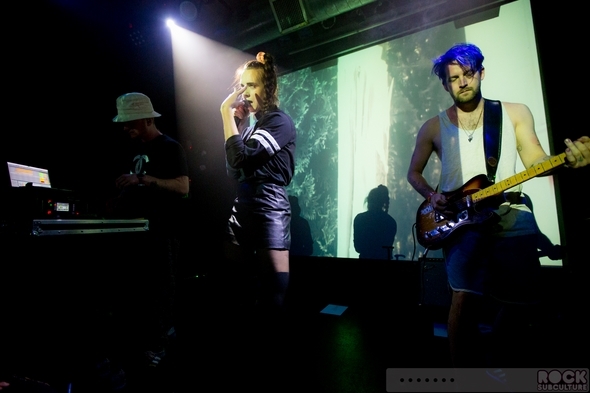 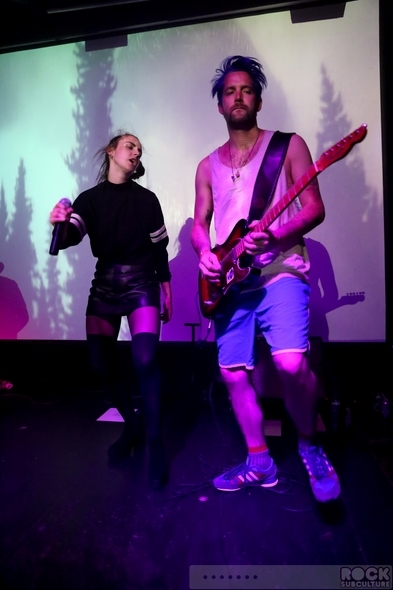 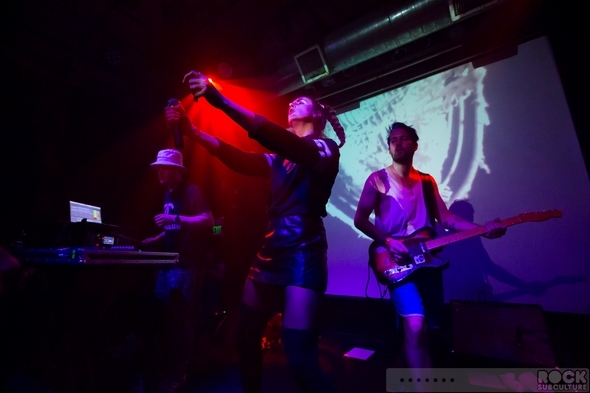 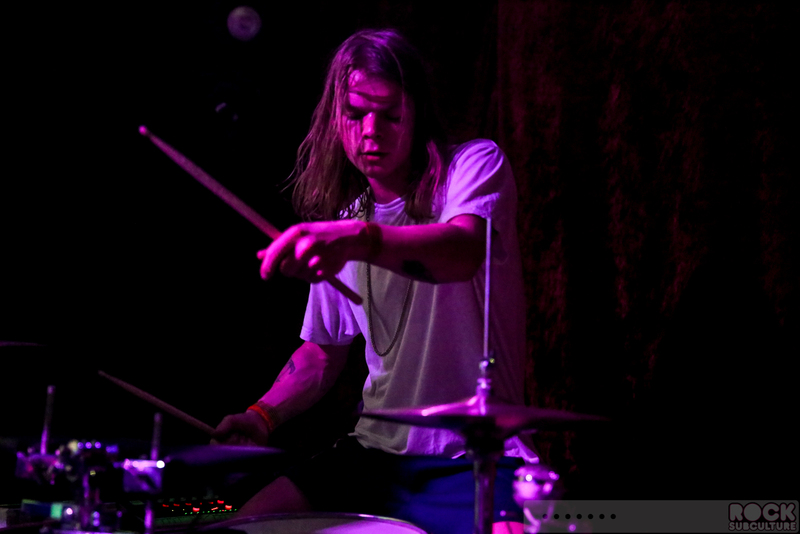 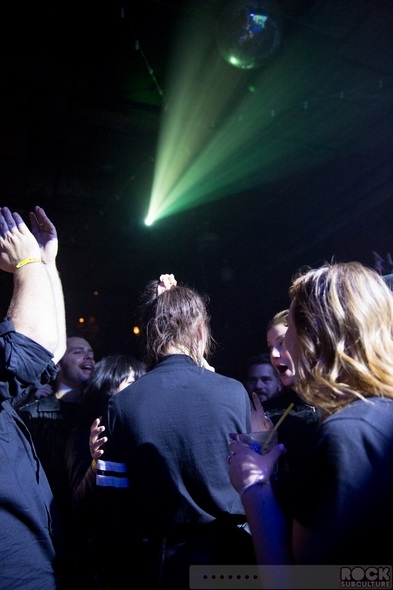 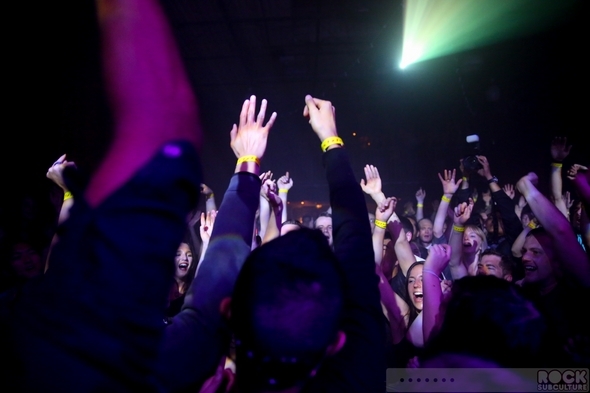 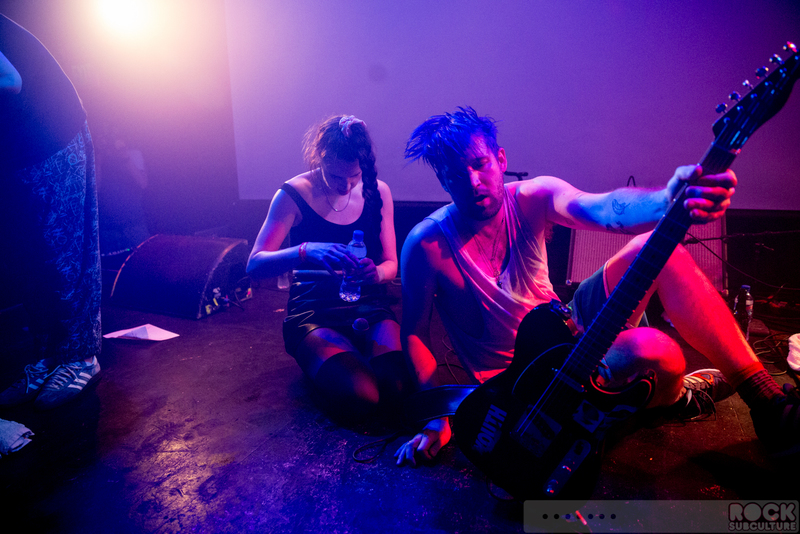 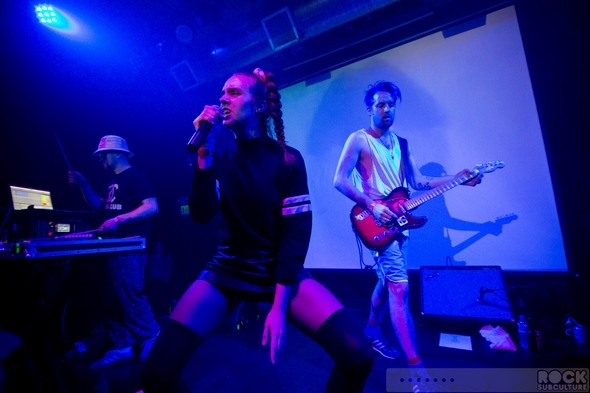 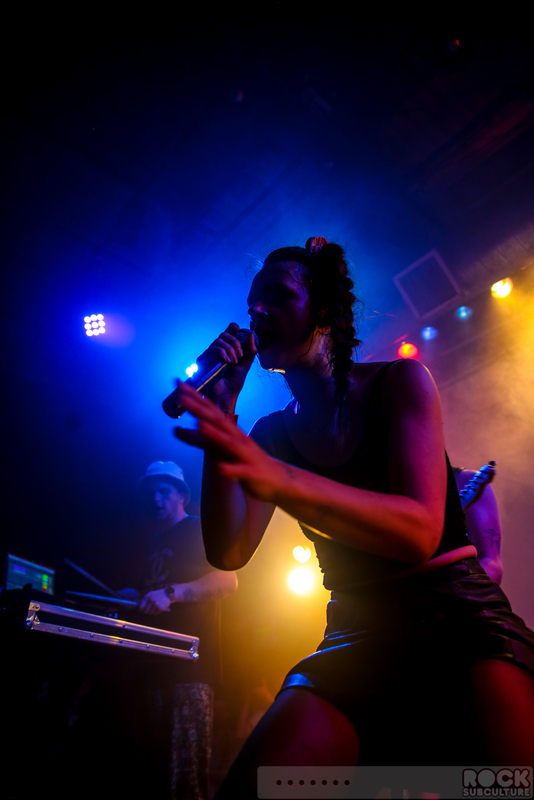 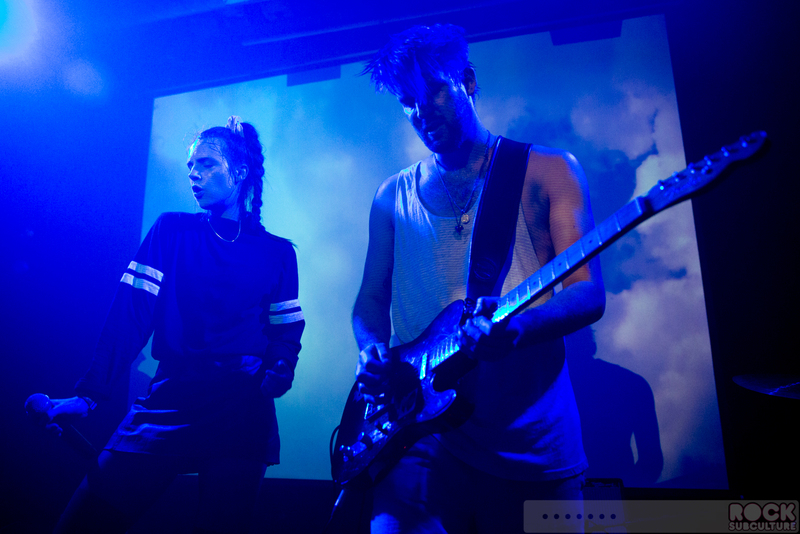 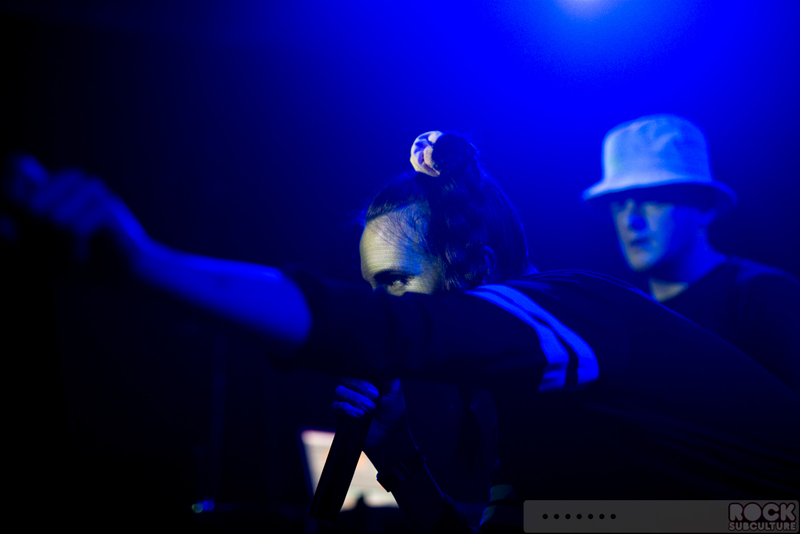 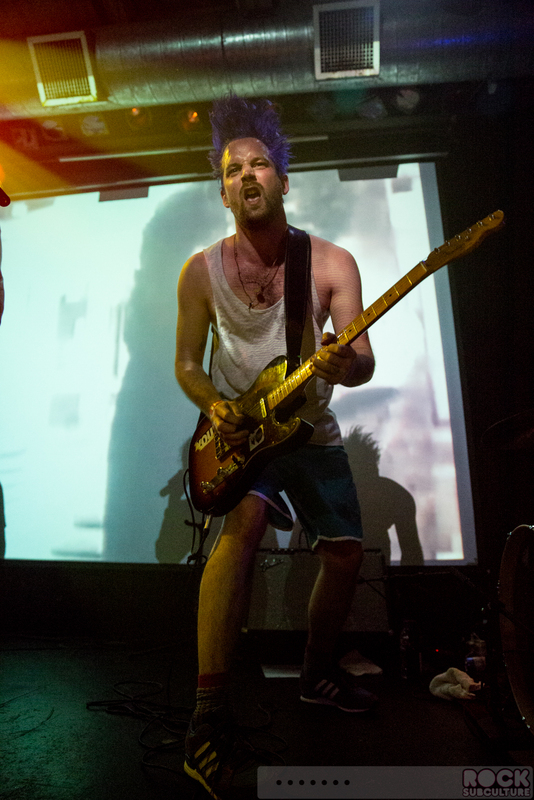 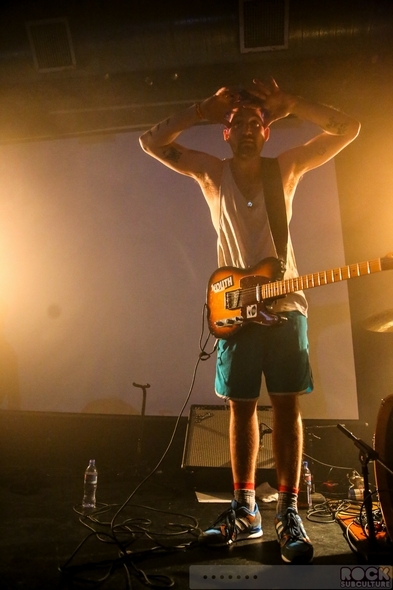 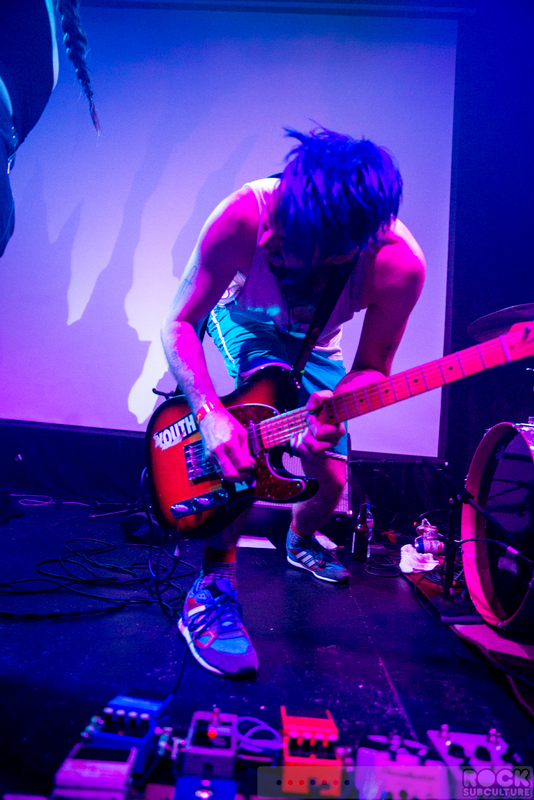 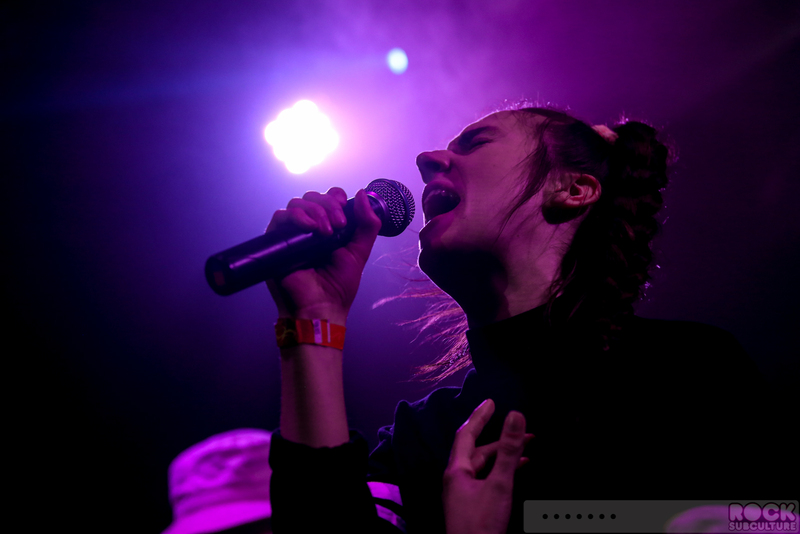 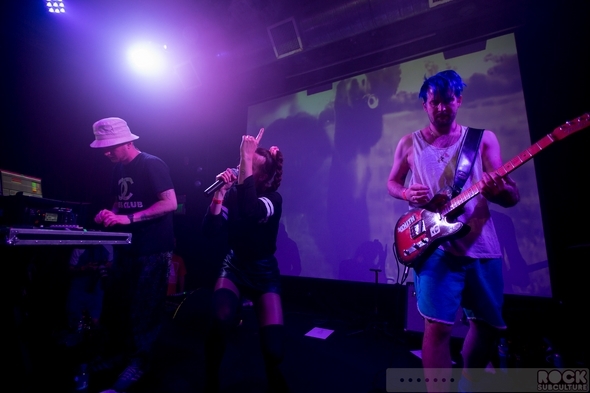 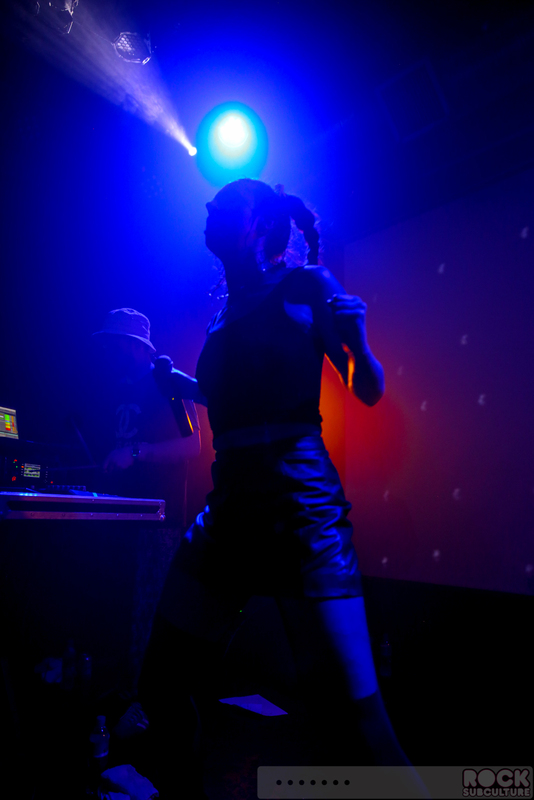 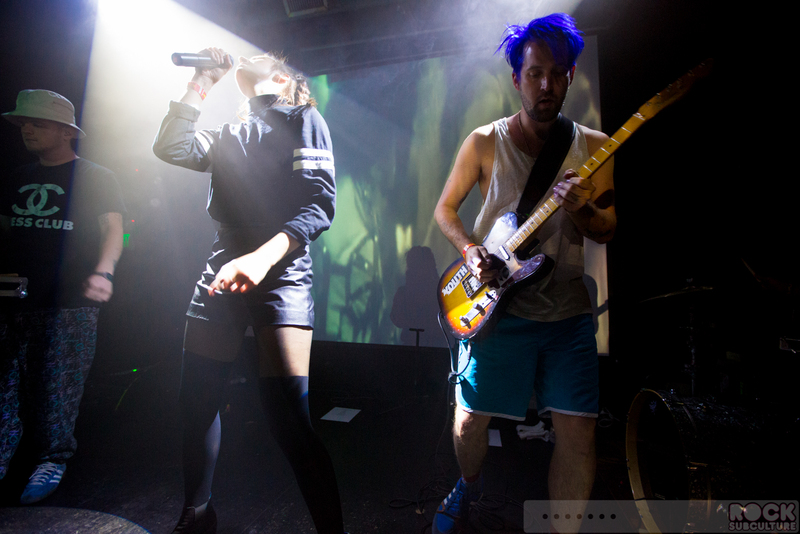 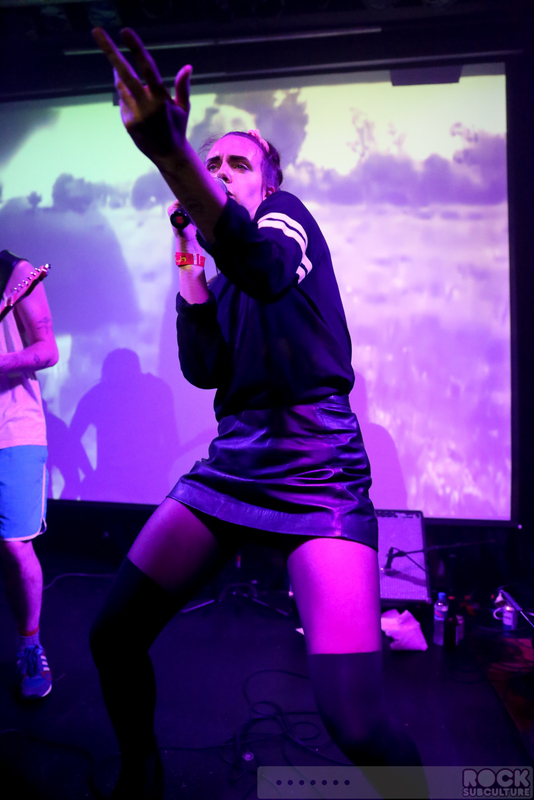 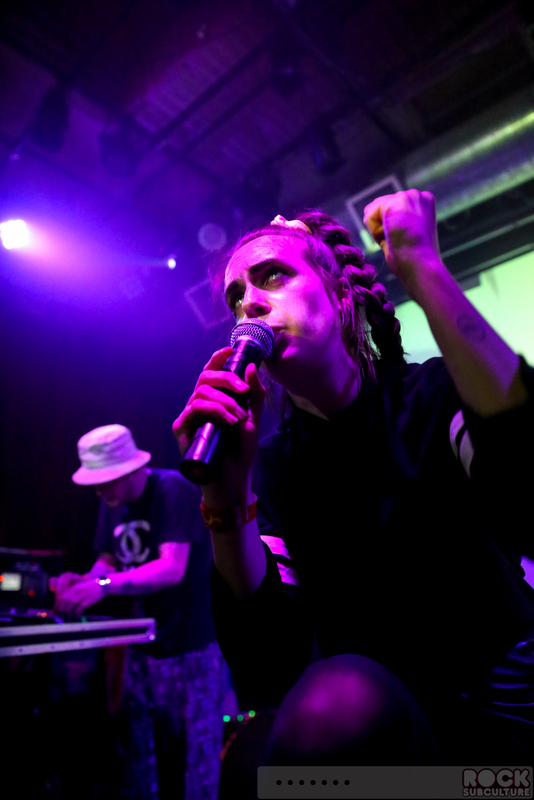 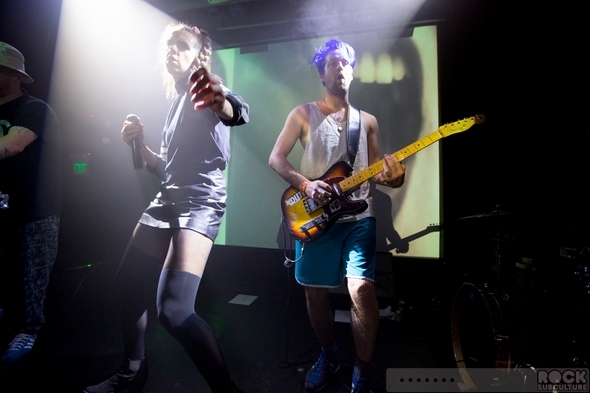 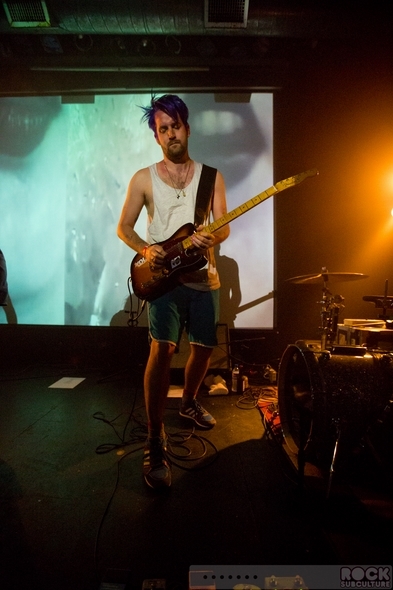 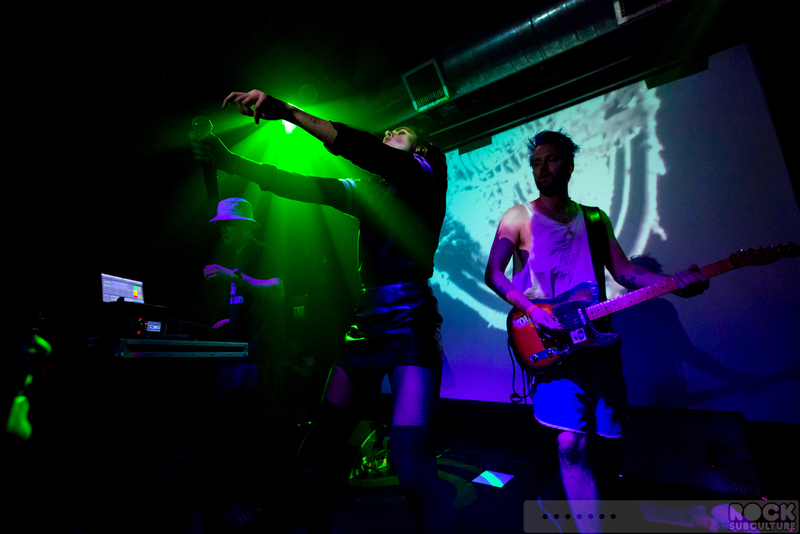 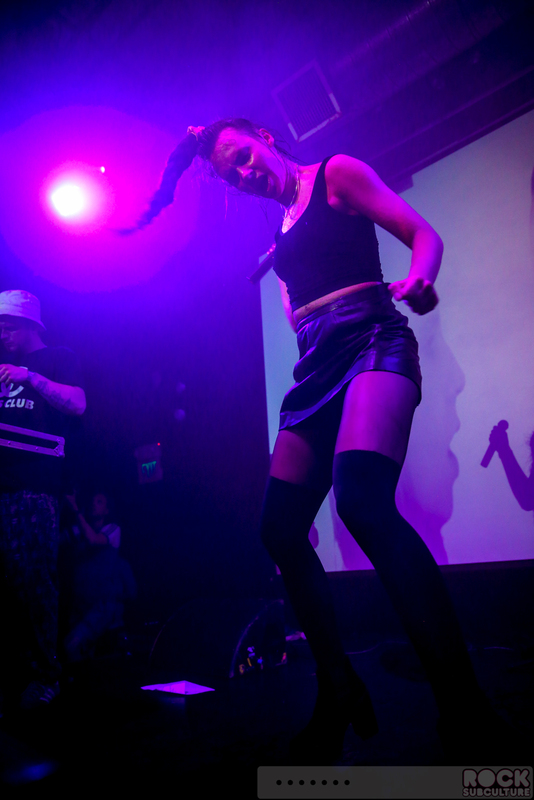 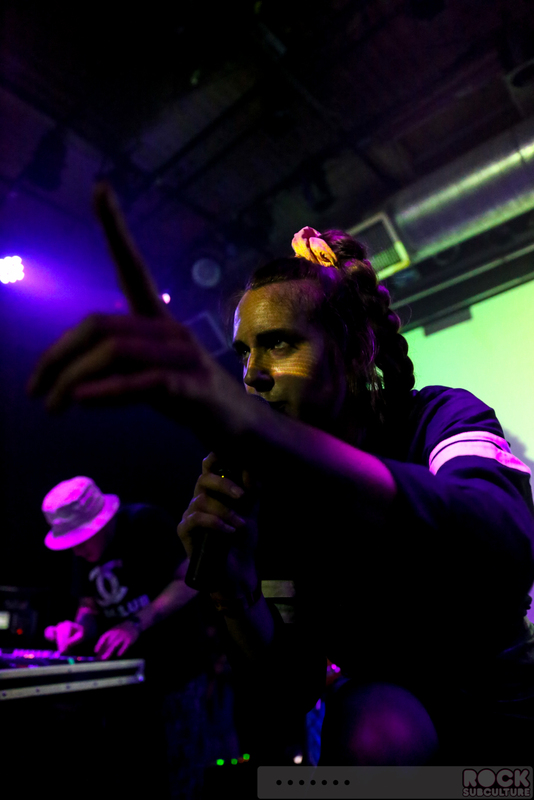 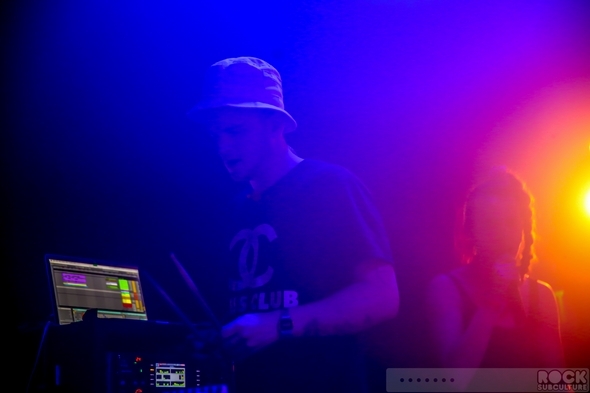 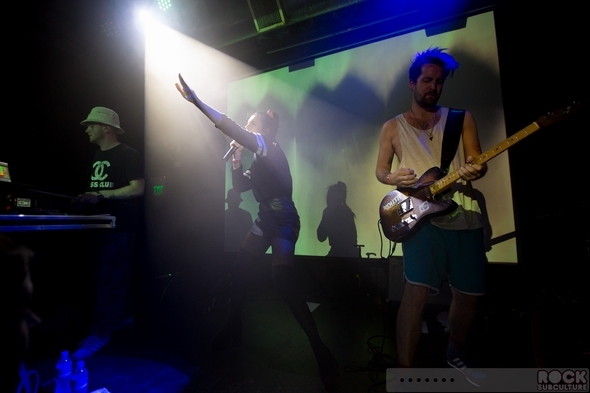 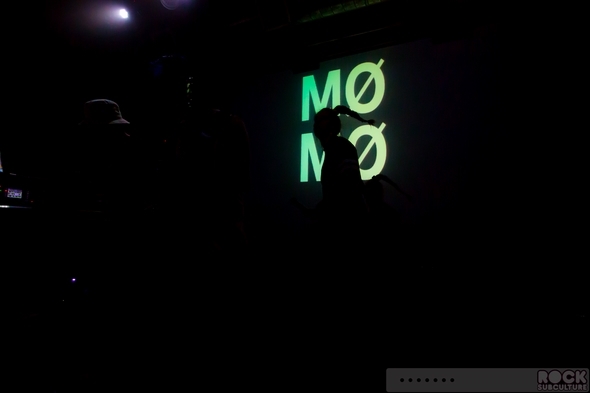 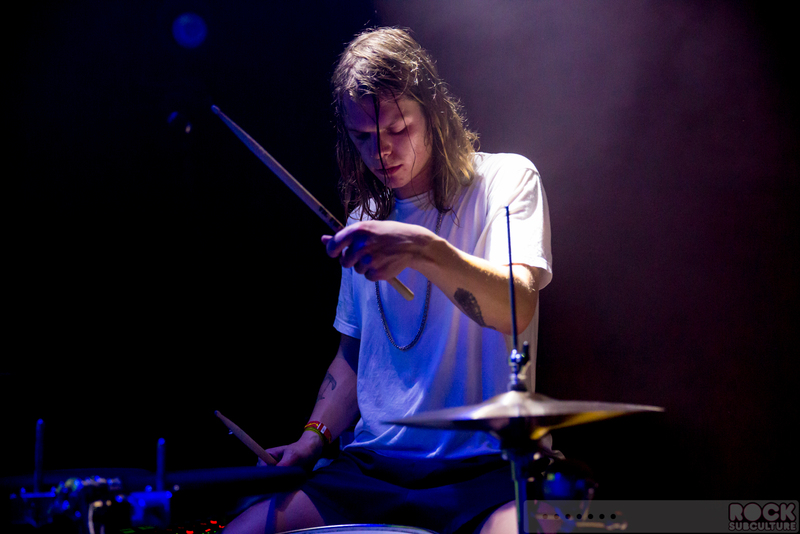 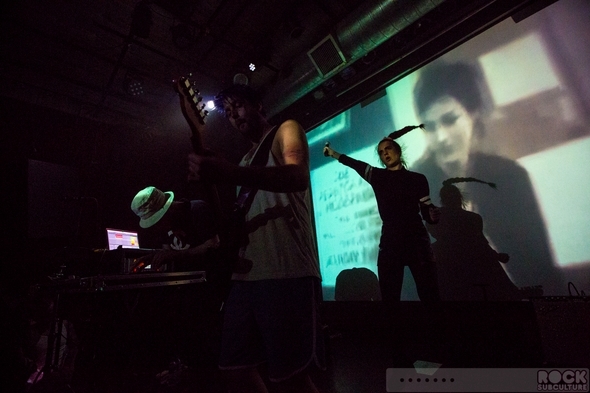 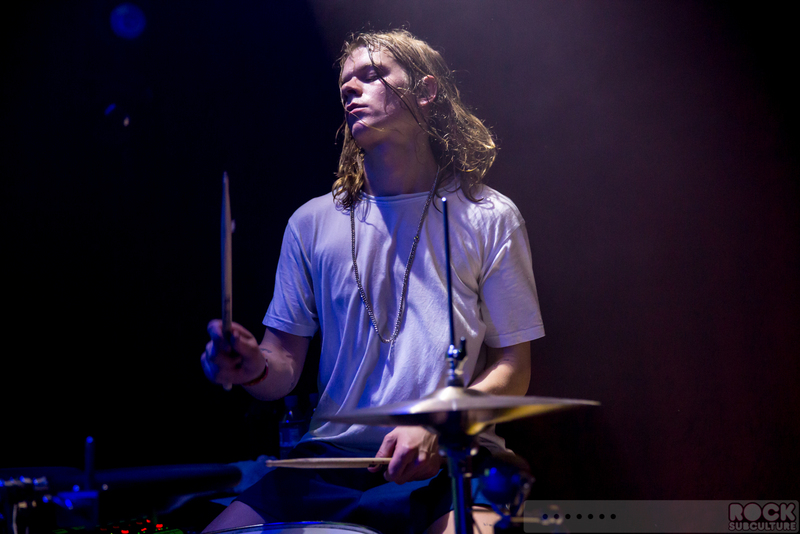 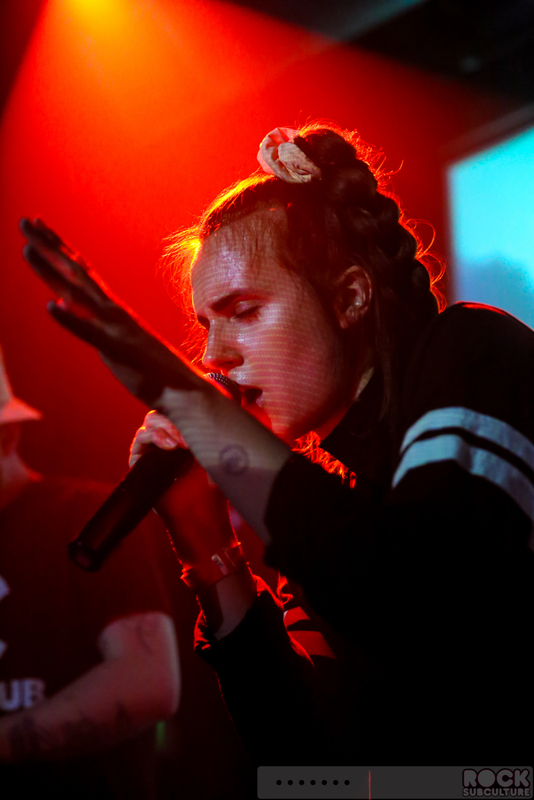 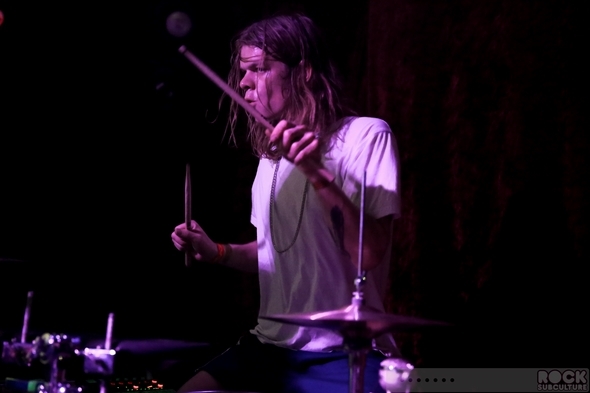 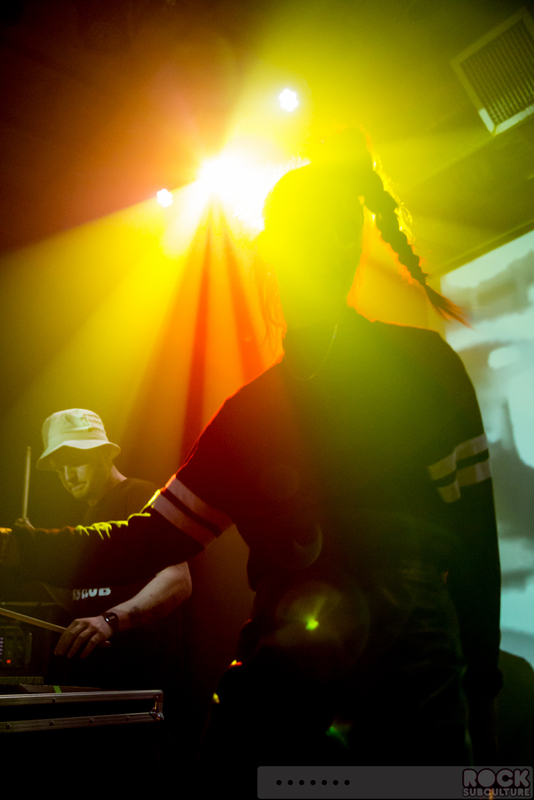 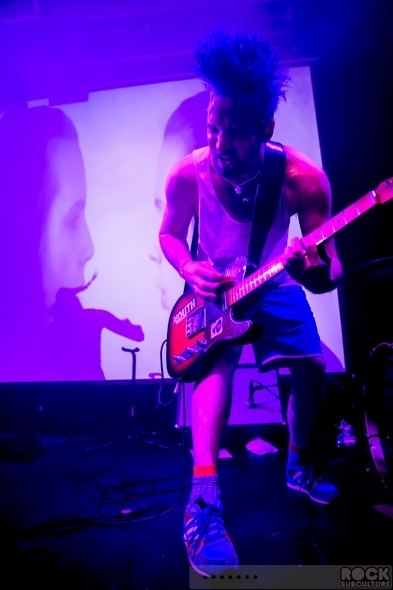 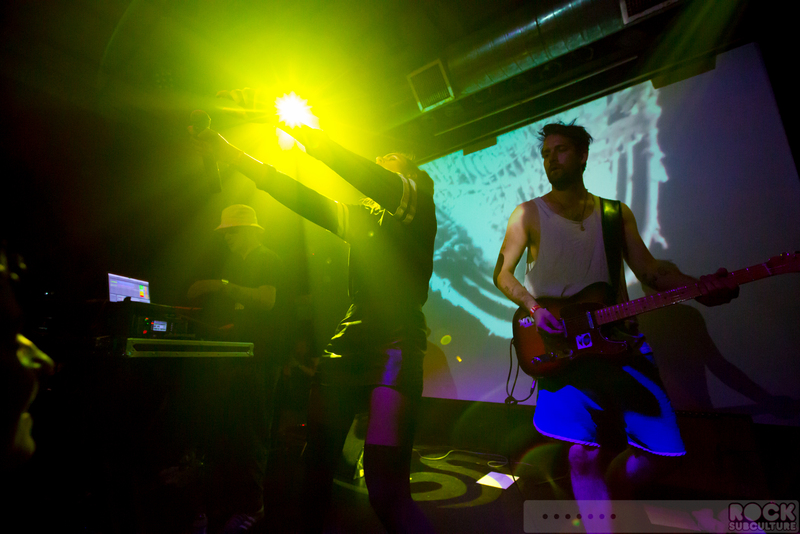 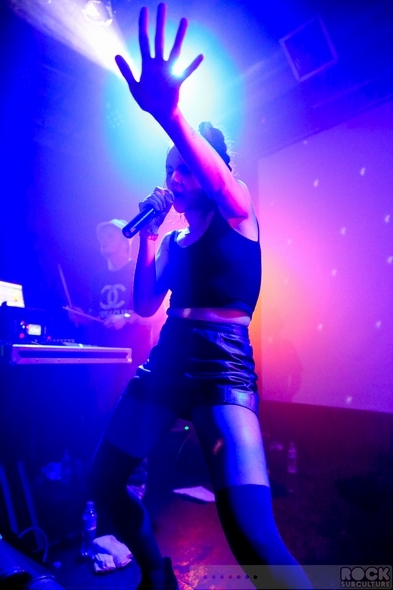 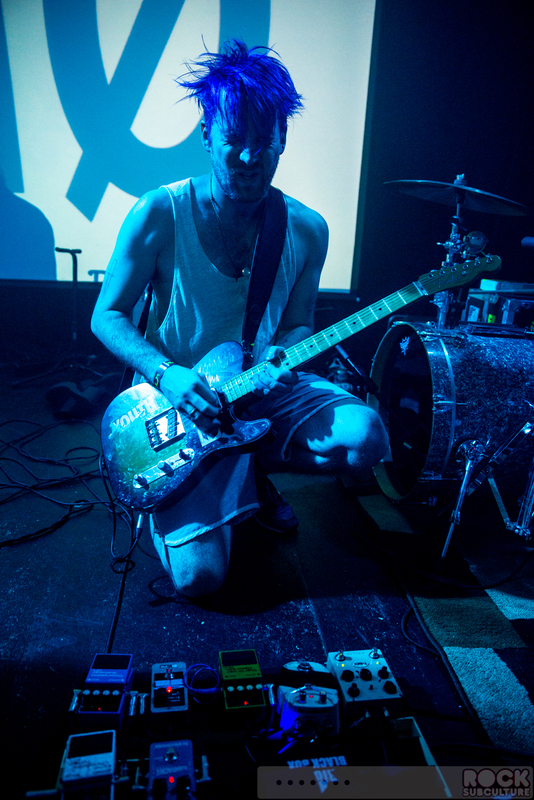 Joining MØ on stage for the concert at Rickshaw Shop was producer Ronni Vindahl on guitar and two other gentlemen on drums and DJ/consoles/electronic drums. It was probably the most electrifying set I’ve seen in some time, with MØ in perpetual motion, using up every inch of the small stage and whipping her long ponytail around as she sung and danced. 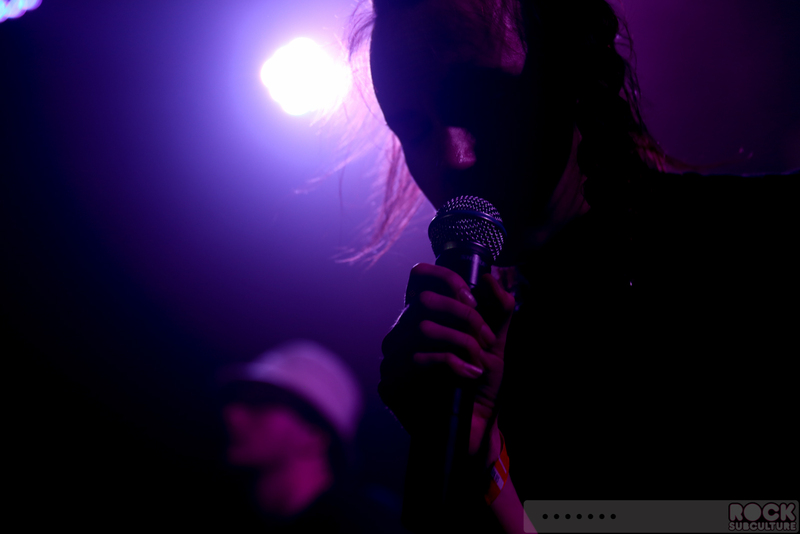 I think it was the first time I put my really fast camera lenses away from the start, in that shooting wide open is unforgiving with locking in the correct depth of field, and since she never stopped moving, it was an effort in futility. 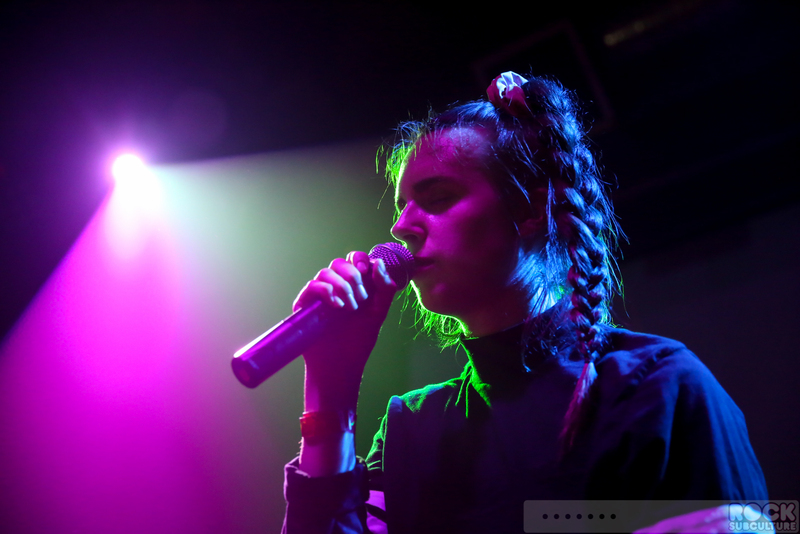 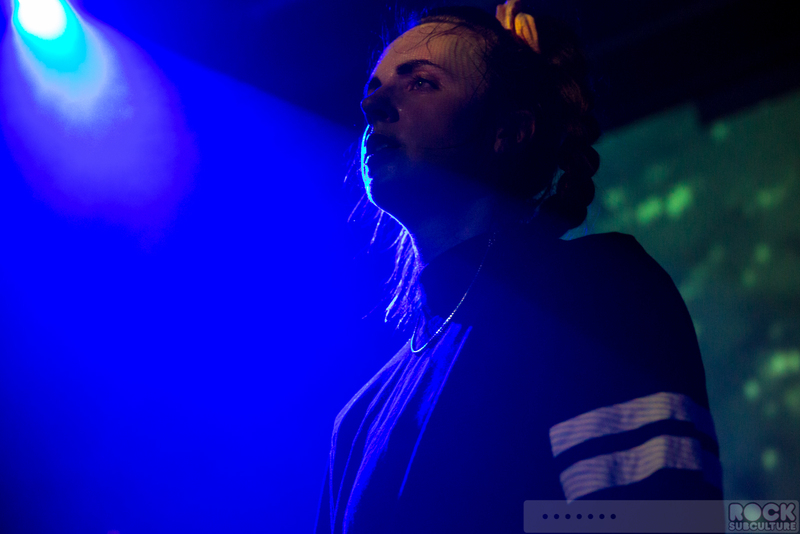 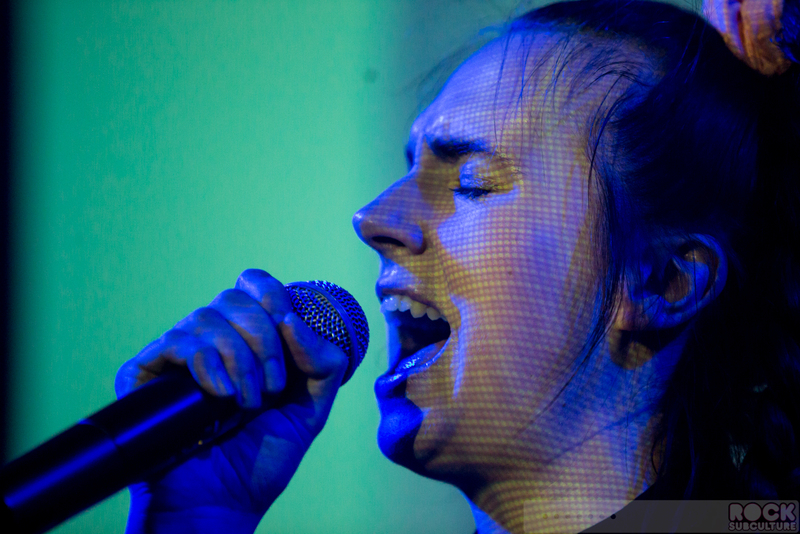 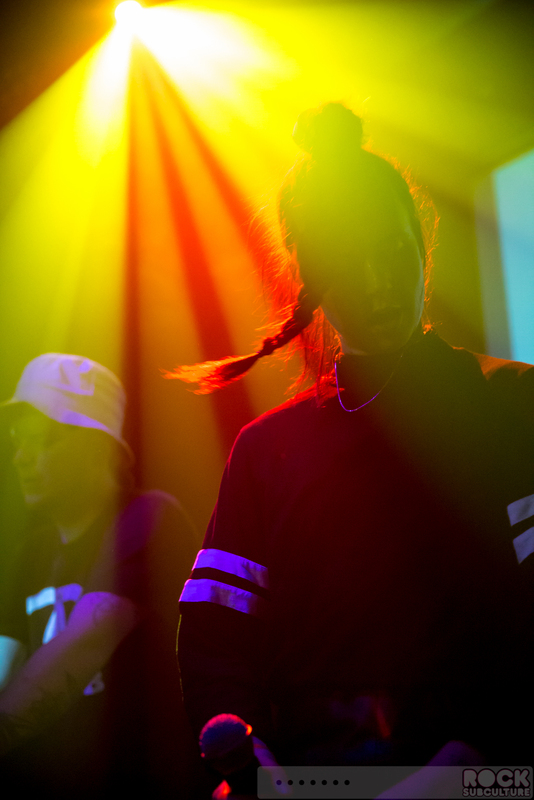 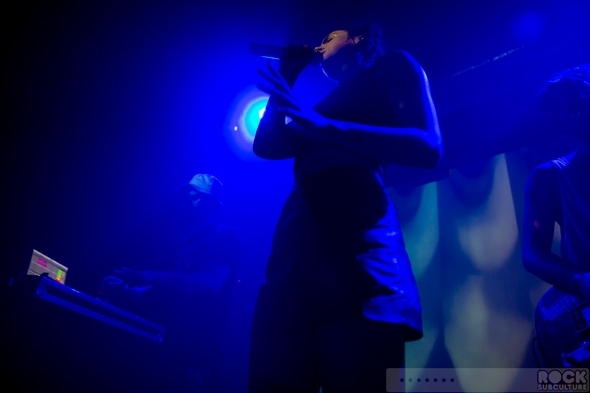 MØ’s music translated beautifully to a live show, and the album provided song after song that kept the audience locked in on the music. 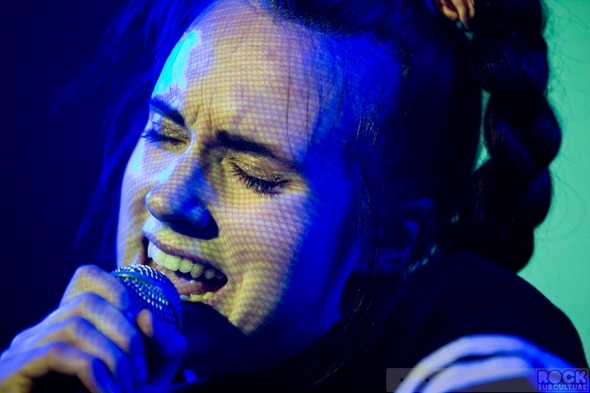 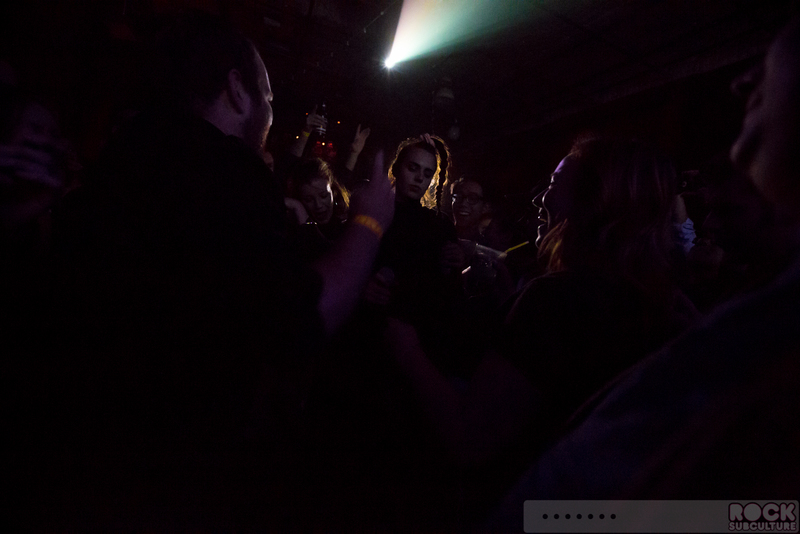 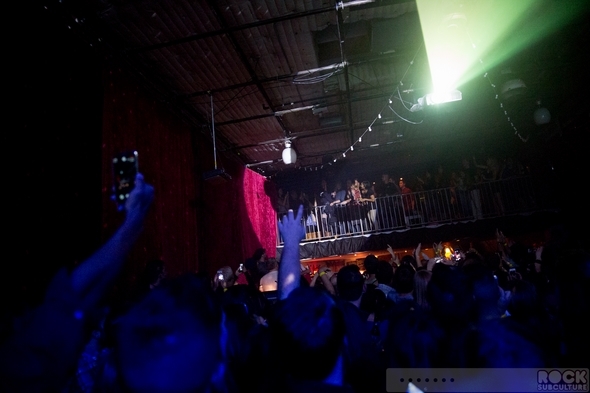 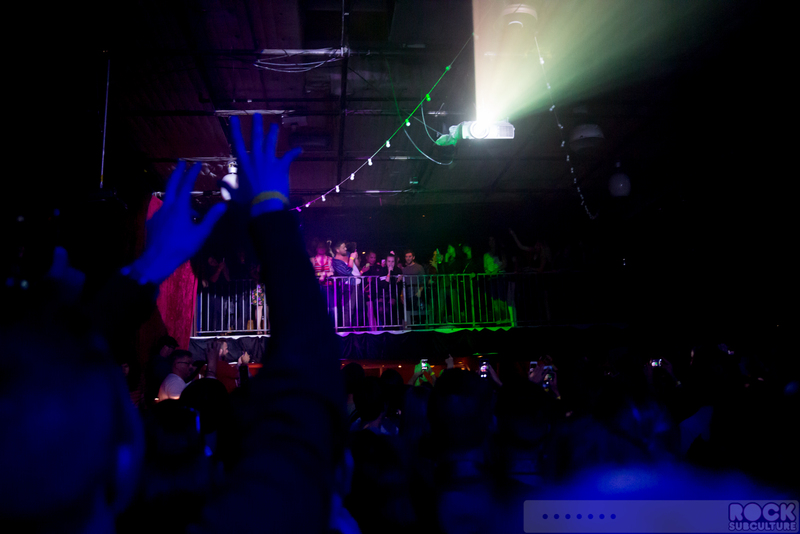 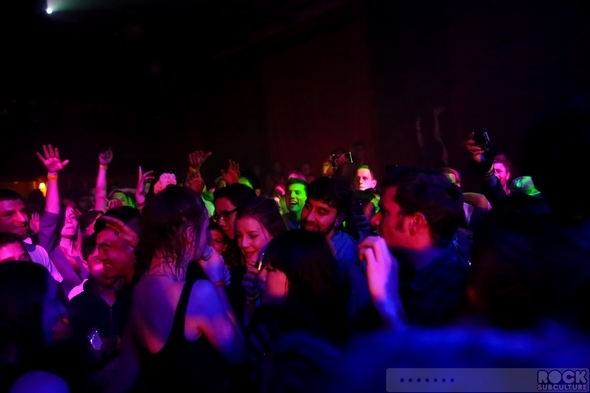 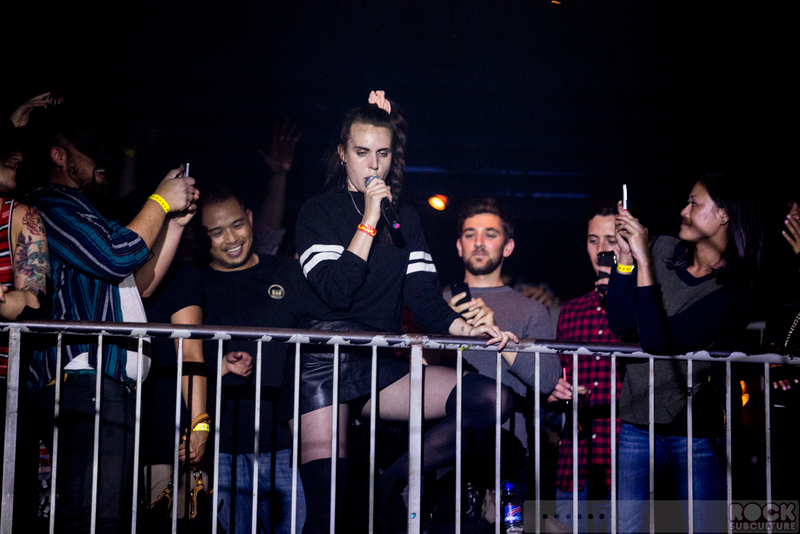 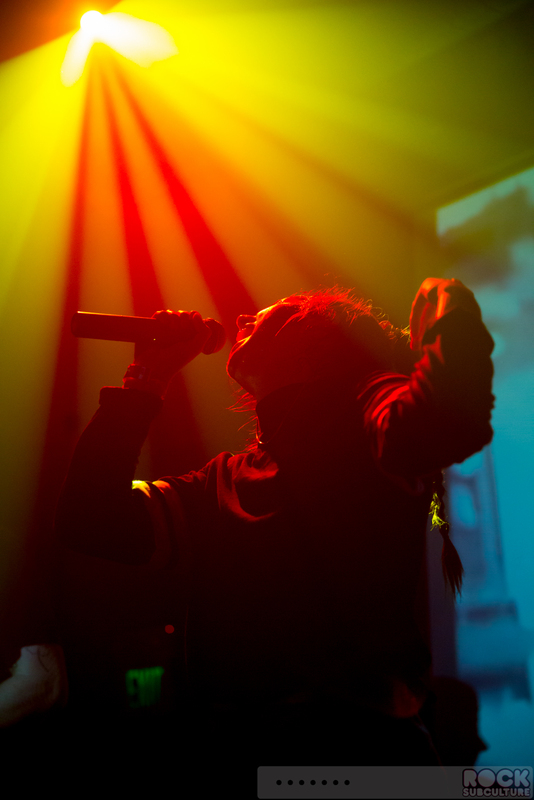 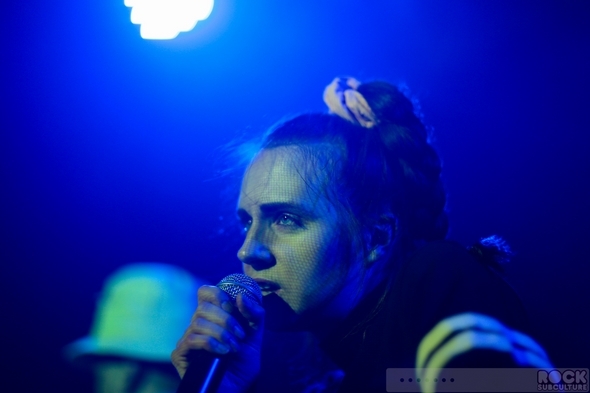 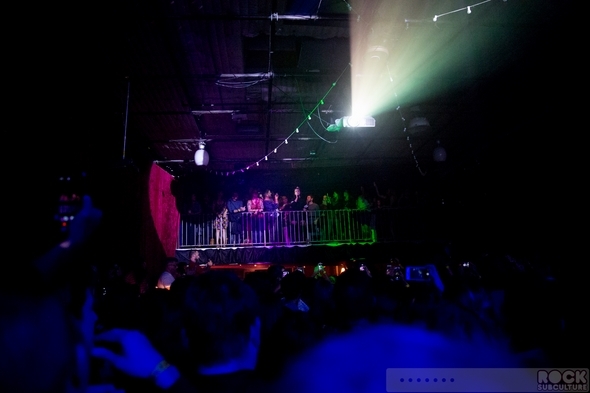 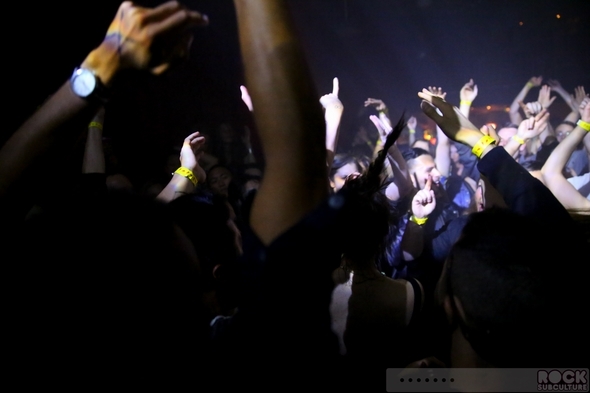 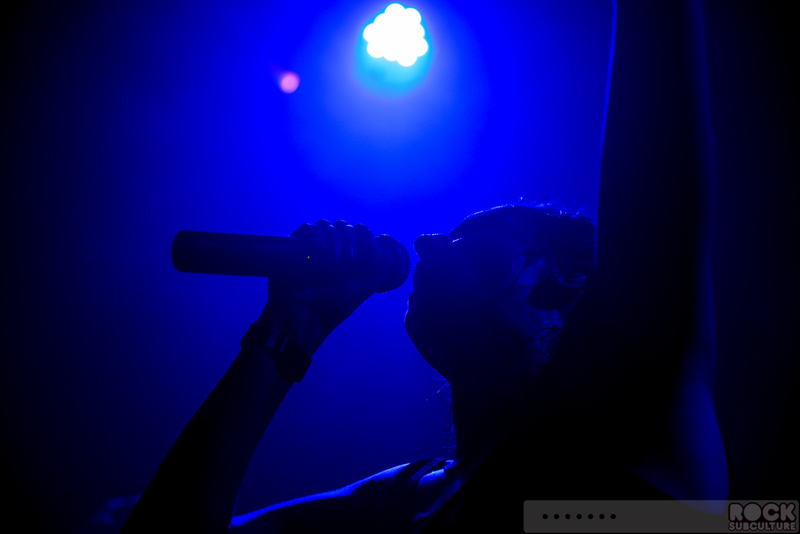 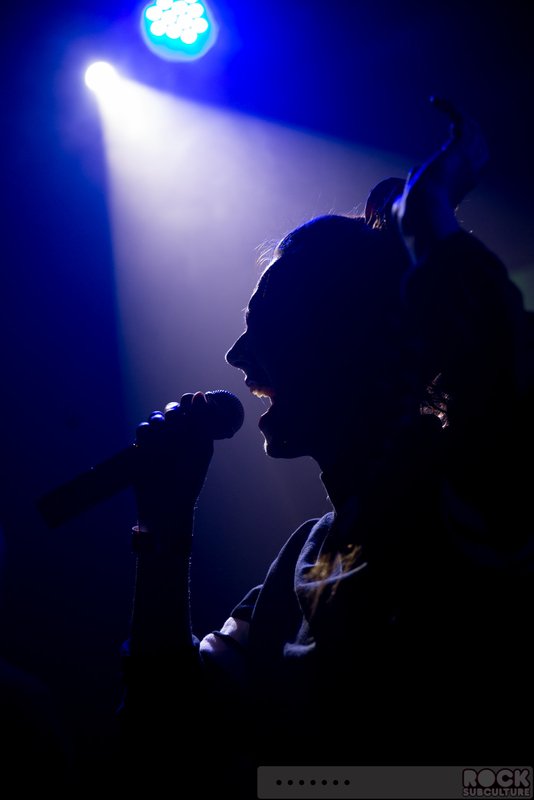 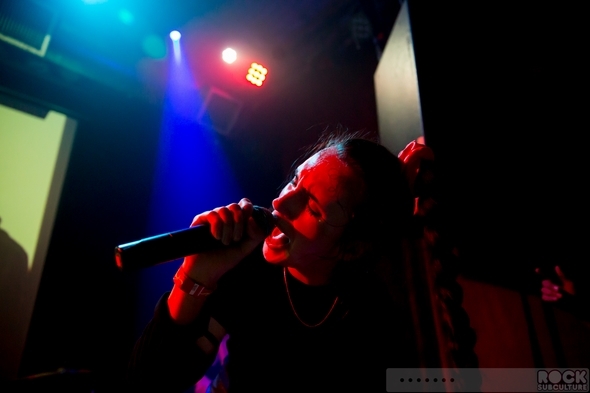 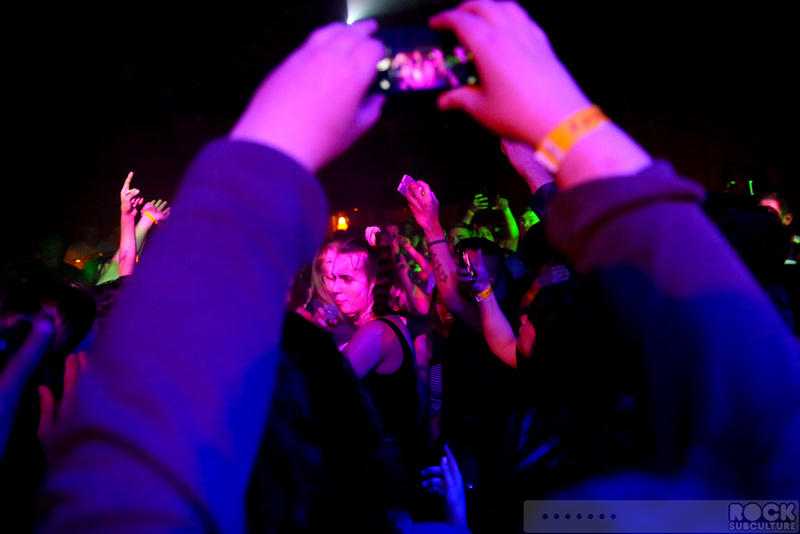 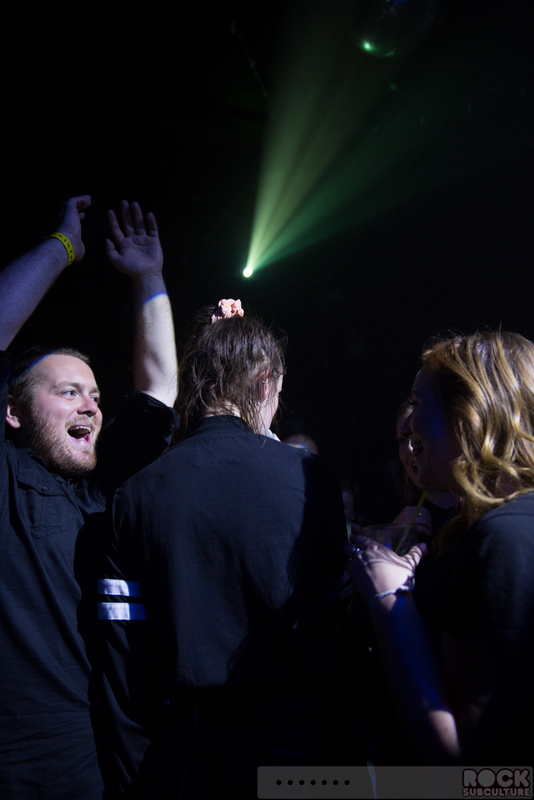 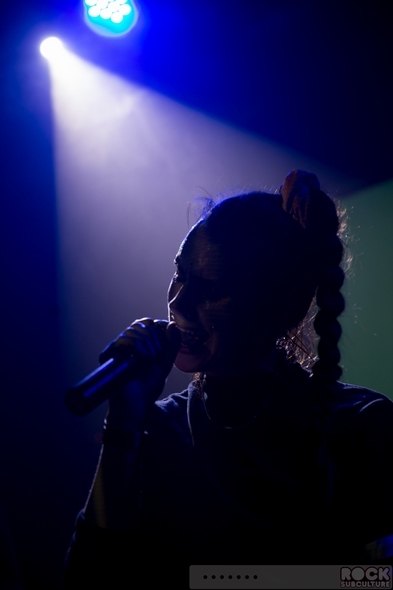 And if that weren’t enough, MØ jumped off the stage and into the crowd several times throughout the night, at one point making her way through the packed floor to the back of the venue, up the stairs, and to the balcony overlooking the stage from above. 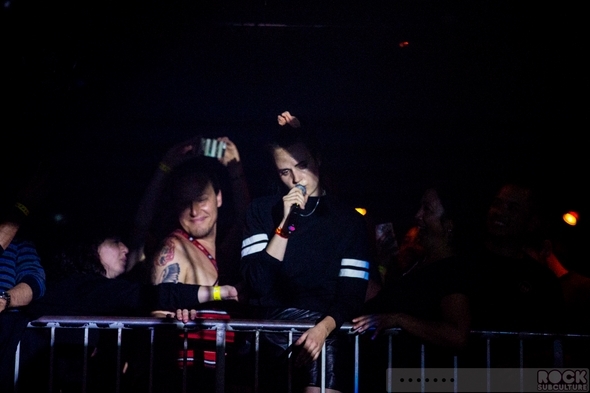 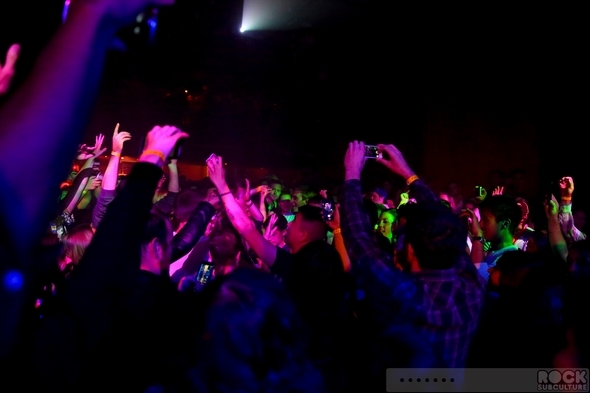 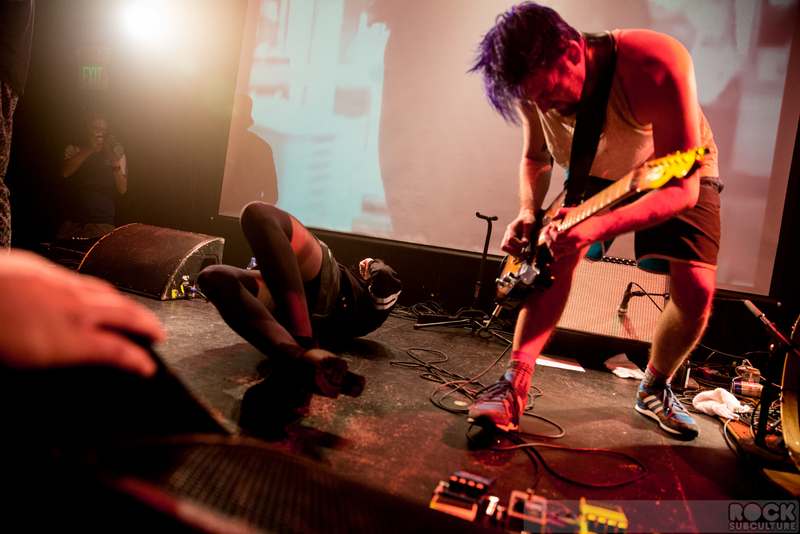 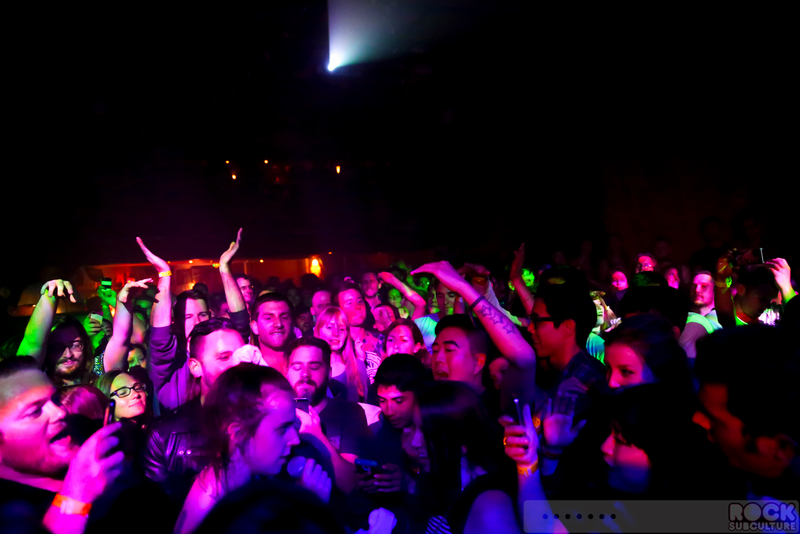 She also spent some time surfing the crowd – I would say she spent more time in the audience than anyone I’ve seen, except perhaps Alice from Crystal Castles. 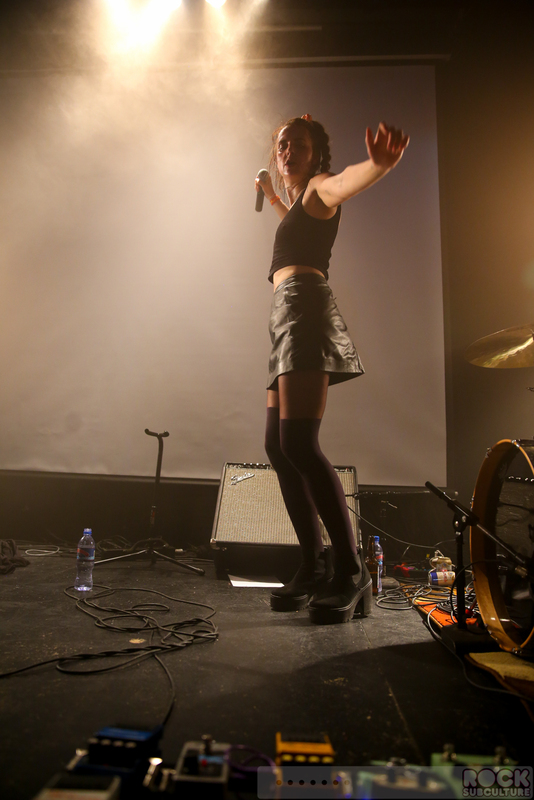 All in all, I was really amazed at the talent and energy from this show, and can’t wait to see her again.